A5()A monitoring device is arranged to receive (401) at least one measurement signal obtained by at least one pressure sensor in an extracorporeal fluid system. The extracorporeal fluid system is in contact with a vascular system of a subject via a fluid connection. The monitoring device is configured to process (403) the measurement signal to identify pressure data that represents pulses originating from a first physiological phenomenon in the subject, excluding the heart of the subject. The extracorporeal fluid system may include an extracorporeal blood flow circuit, e.g. as part of a dialysis machine. The first physiological phenomenon may be any one of reflexes, voluntary muscle contractions, non-voluntary muscle contractions, a breathing system of the subject, an autonomous system of the subject for blood pressure regulation, or an autonomous system of the subject for body temperature regulation. The monitoring device may detect, present, track or predict (409) a disordered condition of the subj ect using the pressure data, or monitor (410) the integrity of the fluid connection based on the pressure data. The present invention generally relates to extraction of data originating from a physiological phenomenon in a subject, in particular when the vascular system of the subject is in connection with an extracorporeal fluid system. The present invention is e.g. applicable in arrangements for extracorporeal blood treatment. Vital signs are measures of various physiological statistics often taken by health professionals in order to assess body functions. Vital signs of a subject, e.g. heart rate, blood pressure, oxygen saturation, electrocardiography (ECG), respiratory rate and autonomous regulation, such as blood pressure and body temperature, may be measured, monitored and interpreted to detect various disorders of the patient, for instance respiratory and heart related disorders. Typical equipment used for retrieving the vital signs includes a thermometer, a pulse oximeter, a capnograph and a pulse watch. Though a pulse may often be taken manually, a stethoscope may be required for a subject with a weak pulse. With external vital sign monitors, such as a thermometer, a stethoscope, a photoplethysmograph (PPG), a pulse oximeter or a capnograph, it is possible to measure pulse, oxygen saturation and information on respiration, such as breathing rate and carbon-dioxide concentration in breath of patient. Patients with kidney function insufficiency often suffer from various other disorders, for instance sleep apnea, periodic breathing and hyperventilation, making monitoring of vital signs of renal patients particularly important. Sleep apnea for instance, is a common disorder in the general population where 2% - 25% suffer from it, and it correlates with increased rate of several co-morbidities, such as hypertension, coronary artery disease, arrhythmias, heart failure and stroke. The prevalence of apnea is even higher in the dialysis population where 30% to 80% of dialysis patients suffer from this problem. The reason for this is not clear, but it is believed that hypervolemia and high levels of uremic toxins may worsen the disorder. In addition, many dialysis patients (40%) are diagnosed with heart conditions such as angina pectoris, left ventricular hypertrophy, stroke or congestive heart failure. These patients and other subjects may also suffer from reflex-controlled phenomena, such as vomiting, coughing and hiccups. Hence, there is a particular need to monitor vital signs of patients with kidney function insufficiency. The origin behind the vital signs are for instance physiological pulse generators, such as the breathing system, the autonomous system for blood pressure regulation and the autonomous system for body temperature regulation, which give rise to cyclic physiological phenomena which are known to cause variations in the blood pressure of a patient. Blood pressure regulation is part of the complex regulatory system which controls arterial blood pressure and is dependent on sensory inputs related to cardiac output, peripheral resistance to blood flow at the arterioles, the viscosity of the blood, the volume of blood in the arterial system, the elasticity of the arterial walls, etc. Changes in blood pressure are brought about by the control exerted on the same physiological mechanisms. The signals from which information regarding the vital signs are extracted and the sensors being used may vary and instruments for providing this information is often limited in purpose and functionality. Additionally, measurements of vital signs are often time consuming and require involvement and attention from staff competent in handling each instrument. It is known, for instance from US5243990 , of blood pressure monitors, even ones that are included in dialysis machine systems, that allow measurement of the patient's pulse and blood pressure values (e.g. systolic and diastolic pressure) at specified intervals. To get a good picture of body functions, it is often desirable to monitor a plurality of vital signs, requiring a number of specialised sensors or monitors connected to the body of a patient, which is costly, cumbersome and distracting. It is also known that coughing and sneezing may influence physiological measurements obtained from instruments. Coughing may for instance introduce errors in the PPG signal e.g. measured with a pulse oximeter. Hence, there is a need for alternative and/or improved ways of monitoring vital signs for detecting, presenting, tracking and/or predicting disorders, such as disorders related to the respiratory, vascular and autonomous system of the subject. Furthermore, in extracorporeal blood treatment, blood is taken out of a patient, treated and then reintroduced into the patient by means of an extracorporeal blood flow circuit. Generally, the blood is circulated through the circuit by one or more pumping devices. The circuit is connected to a blood vessel access of the patient, typically via one or more access devices, such as needles or venous catheters, which are inserted into the blood vessel access. Such extracorporeal blood treatments include hemodialysis, hemodiafiltration, hemofiltration, plasmapheresis, etc. In extracorporeal blood treatment, it is vital to minimize the risk for malfunctions in the extracorporeal blood flow circuit, since these may lead to a potentially life-threatening condition of the patient. Serious conditions may arise if the extracorporeal blood flow circuit is disrupted, e.g. by an access device for blood extraction (e.g. an arterial needle) coming loose from the blood vessel access, causing air to be sucked into the circuit, or by an access device for blood reintroduction (e.g. a venous needle) coming loose from the blood vessel access, causing the patient to be drained of blood within minutes. Other malfunctions may be caused by the blood vessel access becoming blocked or obstructed, or by the access device being positioned too close to the walls of the blood vessel. In WO 97/10013 , the monitoring involves filtering a measured pressure signal to remove the frequency components that originate from a blood pump, and then detecting the heart signal by analysing the filtered pressure signal. The amplitude of the filtered pressure signal is then taken as an indication of the integrity of the fluid connection. This monitoring technique requires proper filtering and might thus fail if there is a significant frequency overlap between the heart signal and the pulses from the blood pump. Hence, there is also a need for alternative and/or improved ways of monitoring the integrity of a fluid connection between an extra-corporeal circuit and a vascular system of a subject. It is an object of the invention to at least partly overcome one or more of the above-identified limitations of the prior art. One object of the invention is to provide an alternative or complementary technique for monitoring vital signs of a human or animal subject. Another object of the invention is to provide an alternative or complementary technique for monitoring the integrity of the fluid connection between the extracorporeal and vascular systems, and also preferably with an improved robustness and/or an increased certainty of detecting a malfunction in the fluid connection. These and other objects, which will appear from the description below, are at least partly achieved by means of devices, a method and a computer program product according to the independent claims, embodiments thereof being defined by the dependent claims. Embodiments of the invention are based on the insight that these objects may be achieved by processing measurement signals from pressure sensors in an extracorporeal fluid system in contact with a vascular system of a subject, which signals previously have not been considered possible to extract and/or interpret and which signals now have been found to contain valuable information. Thus, embodiments of the invention enable monitoring of vital signs of a human or animal subject by processing a measurement signal obtained in a pressure measurement, the measurement signal being retrieved from a fluid system external of the subject, i.e. an extracorporeal fluid system, and connected to a vascular system of the subject. 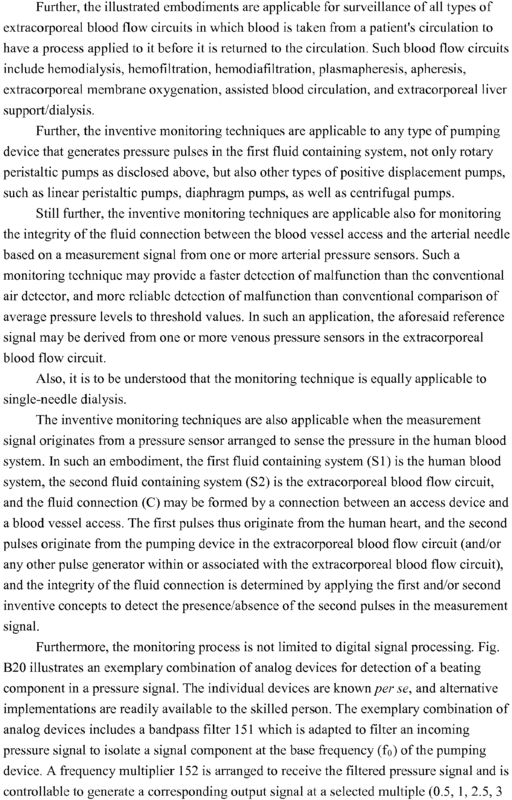 Correspondingly, embodiments of the invention enable monitoring of the integrity of a fluid connection between the extracorporeal fluid system and the vascular system of a subject, by processing such a measurement signal. Embodiments of the invention may, e.g., be used in connection with blood treatment such as dialysis in various forms. A first aspect of the invention is a device for processing a measurement signal obtained by a pressure sensor in an extracorporeal fluid system connected to a vascular system of a subject, said device comprising: means for receiving the measurement signal; and means for processing the measurement signal for identification of pressure data originating from a first physiological phenomenon in said subject, said physiological phenomenon excluding the heart of said subject. 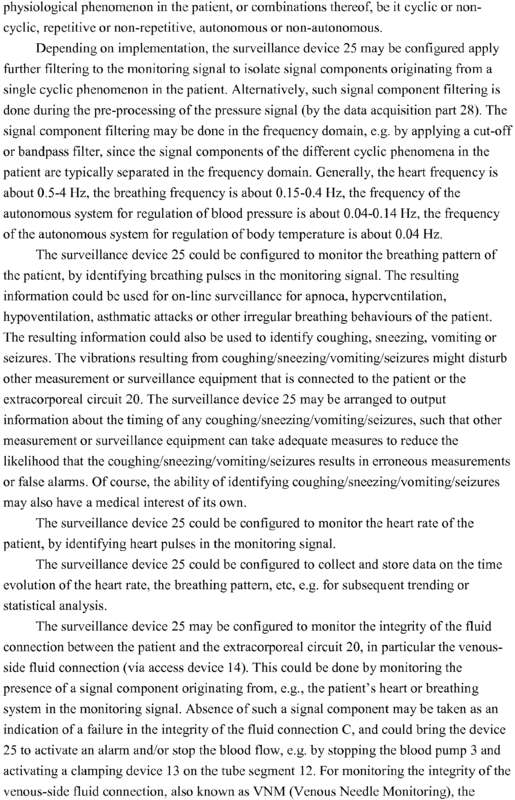 A second aspect of the invention is a method for processing a measurement signal obtained by a pressure sensor in an extracorporeal fluid system connected to a vascular system of a subject, said method comprising: receiving the measurement signal; and processing the measurement signal for identification of pressure data originating from a first physiological phenomenon in said subject, said physiological phenomenon excluding the heart of said subject. A third aspect of the invention is a computer program product comprising instructions for causing a computer to perform the method according to the second aspect. A fourth aspect of the invention is a device for processing a measurement signal obtained by a pressure sensor in an extracorporeal fluid system connected to a vascular system of a subject, said device comprising: an input for receiving the measurement signal; and a signal processor connected to said input and configured to process the measurement signal for identification of pressure data originating from a first physiological phenomenon in said subject, excluding the heart of said subject. According to these aspects, pressure data from a first physiological phenomenon in the subject, excluding the heart of the subject, is identified in the measurement signal. The first physiological phenomenon may be reflexes in the subject, voluntary or non-voluntary muscle contractions in the subject, the breathing system in the subject, the autonomous system of the subject for blood pressure regulation, or the autonomous system of the subject for body temperature regulation. The first physiological phenomenon generates one or more pressure waves that propagate from the vascular system via the fluid connection into the extracorporeal fluid system to the pressure sensor, which is in direct or indirect hydrostatic contact with the fluid (e.g. blood) in the extracorporeal fluid system. The pressure sensor generates a pressure pulse for each pressure wave. A "pulse" is thus a set of data samples that define a local increase or decrease (depending on implementation) in signal magnitude within the time-dependent measurement signal. It is to be understood that the pressure sensor may receive pressure waves from other pulse generators, e.g. the heart of the subject and/or a mechanical pulse generator in the extracorporeal fluid system, and that these pressure waves also generate pressure pulses in the measurement signal. Generally, the identified pressure data represents one or more pulses in the measurement signal that originate from the first physiological phenomenon. However, the pressure data may take many different forms. In one variant, the pressure data is a parameter value which is extracted directly from the measurement signal. 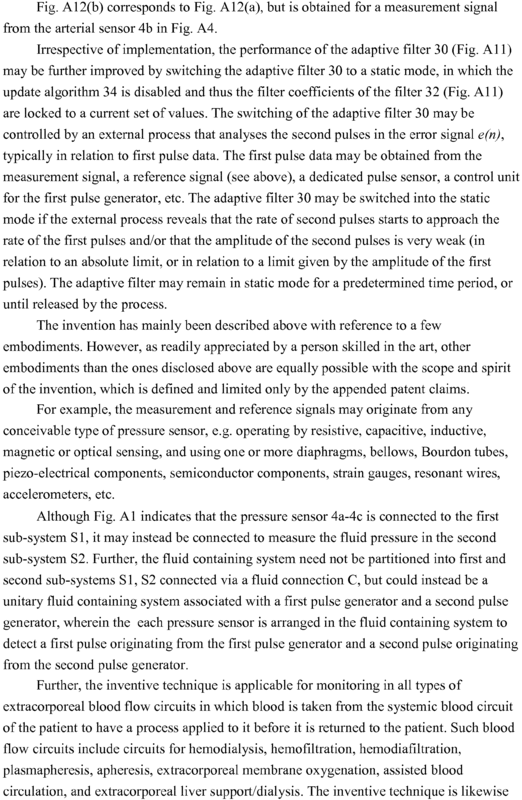 As noted above, the measurement signal may not only include one or more relevant pulses from the first physiological phenomenon, but may also include other pulse signals such as pulses from the heart of the subject, pulses from a mechanical pulse generator in the extracorporeal fluid system, as well as pulses from other physiological phenomena in the subject. However, in certain embodiments, it may be possible to calculate a parameter value that represents the relevant pulses from the first physiological phenomenon in the measurement signal. In another variant, the pressure data is a time-dependent monitoring signal, which is obtained by processing the measurement signal to improve/facilitate identification of the relevant pulses from the first physiological phenomenon, either in the time domain or in the frequency domain. For example, the processing may result in a significant suppression or even elimination of unwanted or interfering signals in the measurement signal. Such unwanted signals may include pulses from the mechanical pulse generator and/or pulses from the heart of the subject and/or pulses from other physiological phenomena in the subject. After this processing, one or more relevant pulses have been extracted from or "isolated in" the measurement signal. As used herein, "to isolate relevant pulses" indicates that the measurement signal is processed to such an extent that the pulses that originate from the first physiological phenomenon can be detected and analyzed in the identified pressure data. The measurement signal may be processed to at least significantly exclude the heart pulses and/or to at least significantly exclude other unwanted signals, such as the pulses that originate from the mechanical pulse generator. For example, the measurement signal may be low-pass filtered to remove frequencies above about 0.4, 0.45, 0.5, 0.55, 0.6, 0.65, 0.7, 0.75 or 0.8 Hz. In another example, the measurement signal may be band-pass filtered in at least one of the frequency ranges about 0.15 Hz to about 0.4 Hz, about 0.04 Hz to about 0.15Hz, and about 0.001Hz to about 0.1 Hz. In yet another example, the measurement signal is high-pass filtered to at least remove frequencies below about 3-5 Hz, and preferably below about 3.5-4 Hz, e.g. to isolate pulses originating from fast muscle contractions, movements and sounds from abdomen and bowels, the subject speaking, etc. It is to be understood that "to isolate relevant pulses" need not exclude that the monitoring signal includes pulses from one or more further physiological phenomena, other than the heart, in the subject. However, in certain embodiments, the monitoring signal may indeed be generated substantially with signal components only from the first physiological phenomenon. In yet another variant, the pressure data is a parameter value which is extracted from the above-mentioned monitoring signal. After its identification, the pressure data may be processed or used for the purpose of detecting and/or presenting and/or tracking and/or predicting a disordered condition of the subject. Alternatively or additionally, the pressure data may be processed or used for the purpose of determining the integrity of the fluid connection. Embodiments of the present invention apply to processing of measurement signals both off-line and on-line, i.e. both during, e.g. concurrently, and subsequent to a treatment, such as dialysis, as well as separated from such a treatment. The measurement signal may comprise raw data or pre-processed data, for instance filtered for signal noise reduction. Embodiments of the present invention are applicable to conditions involving particular sources of signal noise and artefacts, such as a running pump. The processing may for instance involve pre-processing including general signal filtration, removal of particular signal noise (typically measurement noise) and signal artefacts, such as from a running pump, and signal analysis. Embodiments of the present invention are also flexible in advantageously allowing continuous as well as intermittent measurements. As an advantage of embodiments of the present invention, continuous or intermittent measurements of respiration and autonomic regulation, such as blood pressure regulation and temperature regulation, may be provided directly from the extra-corporeal circulation during e.g. dialysis treatment. Thus, a plurality of vital signs can be monitored simultaneously and continuously using a time-dependent pressure signal from the extra-corporeal circulation, and the need to attach a number of specialised sensors or monitors the body of the subject is reduced. Embodiments of the invention may be beneficial for unattended patients, e.g. patients performing dialysis at home or nocturnal patients with limited staffing. Embodiments of the invention also enable monitoring of the integrity of the fluid connection between the extracorporeal fluid system and the vascular system irrespective of any frequency overlap between the heart pulses and the pulses from mechanical pulse generators in the extracorporeal fluid system. For example, the monitoring may be based on pulses originating from a physiological phenomenon, other than the heart, that are shifted in frequency and/or time from pulses originating from the mechanical pulse generators. Still other objectives, features, aspects and advantages of the present invention will appear from the following detailed description, from the attached claims as well as from the drawings and appendixes. Embodiments of the inventive concepts will now be described in more detail with reference to the accompanying schematic drawings. Fig. 1 is a schematic view of a general fluid containing system in which inventive data processing may be used for filtering a pressure signal. Fig. 2 is a plot of breathing signals generated/extracted from the measurement signal and from a reference instrument (capnograph) as a function of time. Fig. 3 is another plot of breathing signals from the measurement signals as a function of time. Fig. 4 is flow chart of a signal identification process according to one embodiment of the invention. Fig. 5 is a plot of a breathing signal as a function of time. Fig. 6 is a plot of an exemplifying breathing disorder response. Fig. 7 is a plot of breathing related parameters identified in connection with a breathing disorder. Fig. 8 is a plot of a blood pressure turbulence event (BPT) in a) a healthy subject and b) a subject with unhealthy cardiovascular response. Fig. 9 is a plot of breathing signals in connection with an event of blood pressure turbulence. Fig. 10 is a plot of breathing signals as measured at the venous and arterial pressure side, respectively, in connection with an event of blood pressure turbulence. Fig. 11 is a schematic view of a system for hemodialysis treatment including an extracorporeal blood flow circuit. In the following, embodiments will be described with reference to fluid containing systems in general, and in relation to an extracorporeal blood flow circuit in particular. Thereafter, physiological phenomena and embodiments for extracting signals indicative of such physiological phenomena will be described. Then, exemplary embodiments for detecting disorders based on such extracted signals are described, as well as exemplary embodiments for monitoring the integrity of a fluid connection based on such extracted signals. Throughout the following description, like elements are designated by the same reference signs. Fig. 1 illustrates a general fluid arrangement in which a fluid connection C is established between a first fluid containing system S 1 and a second fluid containing system S2. The fluid connection C may or may not transfer fluid from one system to the other. A first pulse generator 3 is arranged to generate a series of pressure waves in the fluid within the first system S1, and a second pulse generator 3' is arranged to generate single, occasional or a series of pressure waves in the fluid within the second system S2. A single pressure wave may represent a sneezing, occasional pressure waves may represent one or more coughs, and a series of pressure waves may represent regular or non-regular breathing. one or more pressure sensors 4a-4c are arranged to measure the fluid pressure in the first system S 1. As long as the fluid connection C is intact, pressure waves generated by the second pulse generator 3' will travel from the second system S2 to the first system S1, and thus second pulses originating from the second pulse generator 3' will be detected by the pressure sensor(s) 4a-4c in addition to first pulses originating from the first pulse generator 3. It is to be noted that either one of the first and second pulse generators 3, 3' may include more than one pulse-generating device. Further, any such pulse-generating device may or may not be part of the respective fluid containing system S1, S2. The first fluid system may be an extracorporeal fluid circuit, such as an extracorporeal blood flow circuit of the type which is used for dialysis, and the second fluid system may be a vascular system, such as the blood circuit, of a subject. The second pulse generator 3' may also be referred to as a physiological phenomenon, and it may be a physiological pulse generator, cyclic or non-cyclic, repetitive or non-repetitive, autonomous or non-autonomous. The second pulse generator 3' may be a physiological phenomenon from the group consisting of reflex actions, voluntary muscle contractions, non-voluntary muscle contractions, a breathing system of said subject, an autonomous system of said subject for blood pressure regulation and an autonomous system of said subject for body temperature regulation. A reflex action, also known as a reflex, is to be construed as an involuntary and nearly instantaneous movement in response to a stimulus. The fluid arrangement of Fig. 1 further includes a surveillance device 25 which is connected to the pressure sensors 4a-4c. Thereby, the surveillance device 25 acquires one or more measurement signals that may or may not be time-dependent to provide a real time representation of the fluid pressure in the first system S1. The surveillance device 25 monitors the behaviour of a physiological phenomenon of a subject and may issue an alarm or warning signal, and/or alert a control system of the first system S1, to take appropriate action. The surveillance device 25 may or may not process the measurement signal(s) continuously (i.e. on-line). The measurement signal(s) may also comprise a set or batch of measurement signals, extracted for subsequent analysis (i.e. off-line). The surveillance device 25 optionally monitors the integrity of the fluid connection C, based on the principle that the presence of second pulses indicates that the fluid connection C is intact, whereas absence of second pulses indicates that the fluid connection C is compromised. The absence of second pulses may bring the surveillance device 25 to issue an alarm or warning signal, and/or alert a control system of the first or second fluid containing systems S1, S2 to take appropriate action. The surveillance device 25 may thus be configured to continuously process the time-dependent measurement signal(s) to determine whether second pulses are present or not. Typically, the determination involves analyzing the measurement signal(s), or a pre-processed version thereof, in the time domain to calculate a value of an evaluation parameter (i.e. a parameter value) which is indicative of the presence or absence of second pulses in the measurement signal(s). Depending on implementation, the surveillance device 25 may use digital components or analogue components, or a combination thereof, for receiving and processing the measurement signal(s). In the context of the present disclosure, "absence" of a pulse may imply that the pulse has disappeared, or at least that it has decreased sufficiently compared to the pulse deemed to be "present". 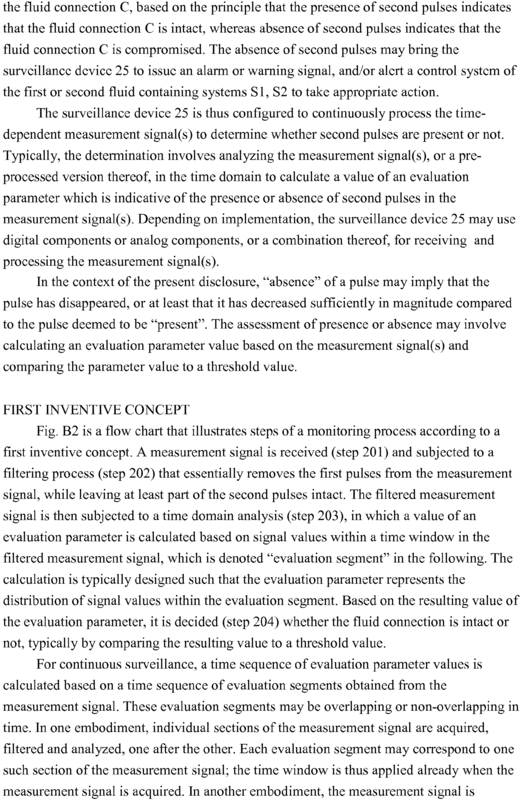 The assessment of presence or absence may involve calculating an evaluation parameter value based on the measurement signal(s) and comparing the parameter value to a threshold value. Fig. 11 shows an example of an extracorporeal blood flow circuit 20 of the type which is used for dialysis. The extracorporeal blood flow circuit 20 comprises an access device for blood extraction in the form of an arterial needle 1, and an arterial tube segment 2 which connects the arterial needle 1 to a blood pump 3 which may be of peristaltic type, as indicated in Fig. 11, or any other suitable type, such as a membrane pump. At the inlet of the pump 3 there is a pressure sensor 4a (hereafter referred to as arterial sensor) which measures the pressure before the pump 3 in the arterial tube segment 2 (in the form of an "arterial pressure signal"). The blood pump 3 forces the blood, via a tube segment 5, to the blood-side of a dialyser 6. Many dialysis machines are additionally provided with a pressure sensor 4b that measures the pressure between the blood pump 3 and the dialyser 6. The blood is lead via a tube segment 10 from the blood-side of the dialyser 6 to a venous drip chamber or deaeration chamber 11 and from there back to the patient via a venous tube segment 12 and an access device for blood reintroduction in the form of a venous needle 14. A pressure sensor 4c (hereafter referred to as venous sensor) is provided to measure the pressure on the venous side of the dialyser 6 (in the form of a "venous pressure signal"). In the illustrated example, the pressure sensor 4c measures the pressure in the venous drip chamber. Both the arterial needle or catheter 1 and the venous needle or catheter 14 are connected to the patient through a blood vessel access. The blood vessel access may be of any suitable type, e.g. a fistula, a Scribner-shunt, a graft, etc. For simplicity, the following discussion presumes that the blood vessel access is a fistula. In relation to the general arrangement in Fig. 1, the extracorporeal blood flow circuit 20 corresponds to the first fluid containing system S1, the blood pump 3 (as well as any further pulse source(s) within or associated with the circuit 20, such as a dialysis solution pump, valves, etc) corresponds to the first pulse generator 3, the blood system of the patient corresponds to the second fluid containing system S2, and a physiological phenomenon of the patient corresponds to the second pulse generator 3' which thus is located within or associated with the blood system of the patient. The fluid connection C corresponds to one or both of the fluid connections between the blood vessel access and the access device 1, 14. In Fig. 11, a control unit 23 is provided, i.a. to control the blood flow in the circuit 20 by controlling the revolution speed of the blood pump 3. The extracorporeal blood flow circuit 20 and the control unit 23 may form part of an apparatus for extracorporeal blood treatment, such as a dialysis machine. Although not shown or discussed further it is to be understood that such an apparatus performs many other functions, e.g. controlling the flow of dialysis fluid, controlling the temperature and composition of the dialysis fluid, etc. In Fig. 11, the surveillance device 25 comprises a data acquisition part 28 for pre-processing the incoming signal(s), e.g. including an A/D converter with a required minimum sampling rate and resolution, one or more signal amplifiers, one or more filters to remove undesired components of the incoming signal(s), such as offset, high frequency noise and supply voltage disturbances. In the examples given herein, the data acquisition part 28 comprises a DAQ card USB-6210 from National Instruments with a sampling rate of 1 kHz and resolution of 16 bits, an operation amplifying circuit AD620 from Analog Devices, a high-pass filter with a cut-off frequency of 0.03 Hz (i.a., for removal of signal offset) together with a low-pass filter with a cut-off frequency of 402 Hz (i.a., for removal of high frequency noise). To obtain a short convergence time, a low-order filter is used for the filters. Furthermore, the data acquisition part 28 may include an additional fixed band-pass filter with upper and lower cut-off frequencies to suppress disturbances outside the frequency interval of interest. The pre-processed data is provided as input to a main data processing part 29, which executes the inventive signal analysis. Embodiments of the present invention utilize the fact that physiological phenomena arising in the body of a subject cause variations in the blood pressure of the subject. It has been found that these variations are, in turn, conducted via the fluid connection(s), the tube segments, the fluid (blood/air) in the tube segments, any intermediate fluid chamber (e.g. drip chamber 11) and the fluid therein, to one or more pressure transducers in the extracorporeal blood flow circuit. By signal analysis it is then possible to extract these pressure variations, and then subsequently, extract rate, amplitude, phase and shape of signals that represent the phenomena. This information may e.g. be useful to medical staff in observing breathing rate and depth of breath of a subject. Implementation of the signal analysis may be done by executing a software algorithm in a computer, e.g. by digital filters, by mechanical filters, e.g. restrictors and compliance volumes, or by electronics, e.g. analogue filters or digital circuits dedicated for the purpose. Hence, measurement data on e.g. respiration, blood pressure and temperature regulation may advantageously be provided on-line and continuously during extra-corporeal circulation. The measurement data may be determined from sensor information obtainable from most extra-corporeal treatment systems without need for extra disposables or making an extra blood access. Hence, embodiments of the present invention enable the provision of vital signs, e.g. respiration rate and amplitude, and autonomous regulation, of a patient, in particular during dialysis treatment. Embodiments of the present invention may be implemented as an apparatus, a computer-implemented method and a computer program product for identifying physiological signals with other origins than the heart of the subject. This is achieved by analysis of signals acquired from a tube/vessel in direct hydrostatic contact with the body of a subject via e.g. a needle or catheter inserted into the blood vessel access of a subject. Temperature regulation due to the autonomous system: approx. 0.001-0.1, with frequencies centred around approx. 0.05 Hz. For the sake of simplicity, the following description will refer to the dialysis field without excluding a broader scope of applications. It will be assumed that the system signals that are subjected to the analysis are delivered by pressure sensors at the venous and/or the arterial side of the blood line (cf. sensors 4c and 4a, respectively, in Fig.11) during a dialysis treatment. However, it may be anticipated that other type of sensors, e.g. optical sensors, such as a photo-plethysmograpy sensor (PPG), displacement sensors, such as strain gauges and accelerometers, may be used as long as these convey equivalent information about relevant physiological signals from the patient. Fig. 4 is a flow chart that illustrates steps of a signal analysis process 400 executed by the surveillance device 25 according to an embodiment of the present invention. It is initiated by receiving a measurement signal 401, e.g. from the venous or arterial pressure sensors, comprising a number of pressure induced signal components. The signal analysis process may be divided into a pre-processing part 402, a signal extraction part 403 and an analysis part 404. 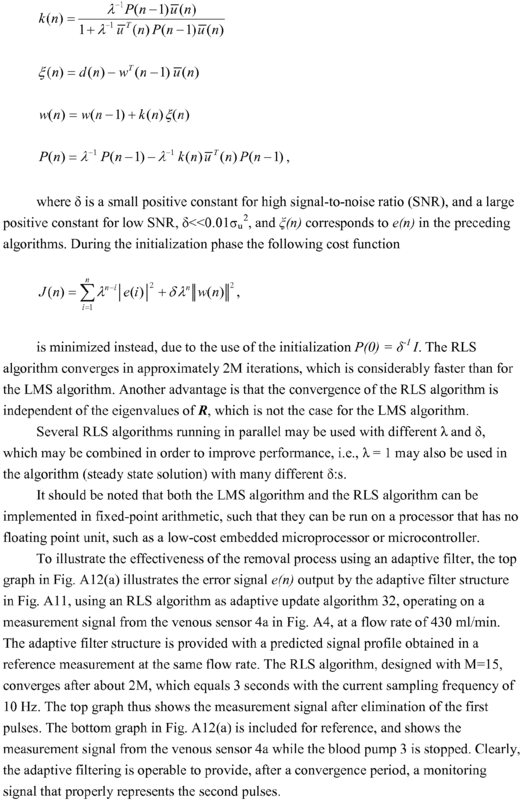 The pre-processing part 402 includes elimination or reduction of signal noise, e.g. 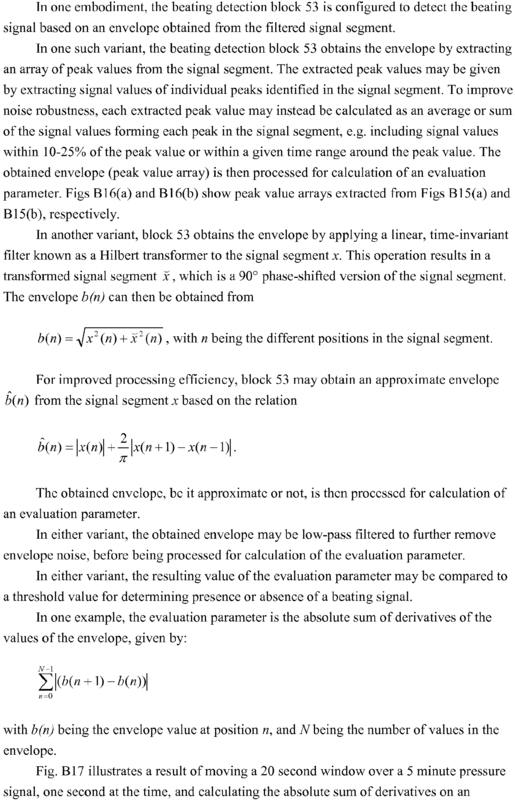 measurement noise, and signal offset, as detailed in the section above relating to the data acquisition part 28. The signal extraction part 403 involves elimination or reduction of pressure artefacts originating from pulse generators in the extracorporeal fluid system and isolation of pressure data originating from a relevant physiological phenomenon. In the context of the present disclosure, "pressure data isolation" 405 denotes a process of generating a time-dependent signal (also denoted monitoring signal herein) which is free or substantially free from pressure modulations caused by any unwanted physiological phenomena. Such unwanted physiological phenomena may vary between different applications, but generally include at least heart beats. 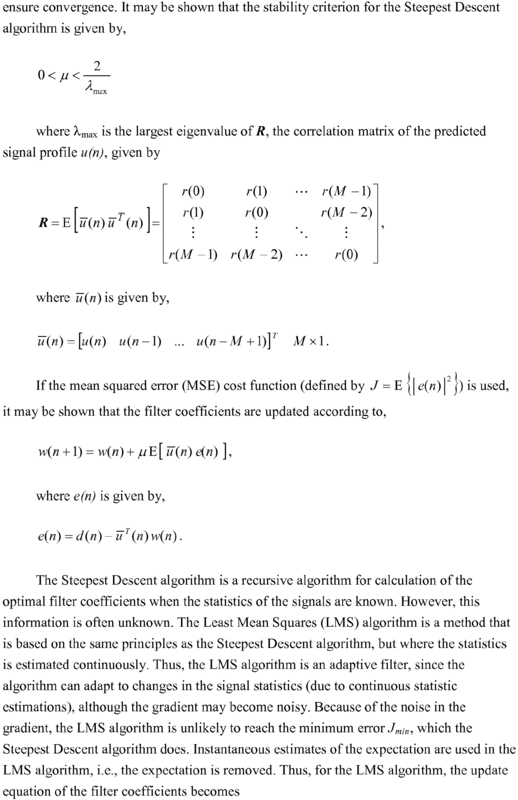 The elimination of signal noise and signal offset (cf. part 402), as well as the elimination of pressure artefacts, may be included in algorithms for pressure data isolation. For instance, the measurement signal may be band pass filtered or low pass filtered to isolate a breathing signal, in a way such that signal noise and/or signal offset and/or pressure artefacts are eliminated from the measurement signal. The elimination of pressure artefacts may thus be performed before, after or during the pressure data isolation. In a pre-analysis step 406 of the analysis part 404, one or more specific signal analysis algorithm(s) are applied for extraction of e.g. rate, amplitude and phase of the relevant physiological phenomenon. In a post-analysis step 408, based on one or more predetermined criteria, the output 407 of the signal analysis algorithm(s) is analysed, e.g. by pattern recognition, for signs of various disorders of physiological or system character, for instance indicated by detection of a disorder in step 409 and detection of the integrity of the fluid connection in step 410. The result of step 409 may be presented, e.g. displayed, to medical staff and may be useful in observing for instance breathing rate and breathing depth of a patient to detect, track or predict disorders and possibly take a corrective action. In the following, the physiological phenomena will be explained in more detail, e.g. reflexes, voluntary muscle contractions, non-voluntary muscle contractions, the breathing system, the autonomous system for blood pressure regulation and the autonomous system for body temperature regulation for a human or animal. These phenomena may also be referred to as physiological pulse generators due to the blood pressure variations they generate. Normally, the arterial blood pressure is modulated by 4 mmHg to 6 mmHg in a wavelike manner during respiration. Deep respiration may result in blood pressure variation of 20 mmHg. "Cross-talk" between different parts of the sympathetic control system of the brain. Signals of the respiratory centre spill over to the centre controlling the vasomotor status causing blood pressure variations, the vasomotor referring to actions upon a blood vessel which alter its diameter by contraction and dilatation. Breathing modulates the heart rate which modulates cardiac output and blood pressure. Modulation of cardiac output due to variations of the pressure in the thoracic cavity during breathing. At inspiration the left ventricle of the heart is supplied with a smaller blood volume since more blood is contained in the blood vessels in the chest at the expense of the pump volume of the heart. Blood pressure will then change as the cardiac output varies. Excitation of baroreceptors of the heart due to respiration. This will cause modulation of blood pressure since the sympathetic system will respond to the stretch of the baroreceptors by changing the blood pressure. The hydro-static pressure change due to the rise and fall of the chest during respiration of a subject in supine position. At inspiration the centre of gravity is elevated which causes increased pressure. Fig. 2 illustrates the synchronous breathing signals from the vein 201 (dotted line) and from the artery 202 (dashed line) generated by the signal extraction processing (cf. 402-403 in Fig. 4) of the venous and the arterial pressure signals recorded during a dialysis treatment by the venous and arterial pressure sensors (cf. 4c, 4a in Fig. 11). A "breathing signal", as used herein, denotes a signal representing/reflecting the repetitive cycles of inhalation and exhalation of a subject. The third curve 203 (solid line) shows a reference of the breathing signal provided by an external capnography device based on measurement of CO2 of the respiration flow. Fig. 3 is a similar plot of the breathing signals in Fig. 2 and shows that the amplitude of the breathing signals 201, 202 extracted from the venous and arterial pressure signals, respectively, change in concordance with the depth of breath given by the capnography signal 203. Vasomotor oscillations appear in the blood pressure in cycles with a length of about 7 seconds to about 26 seconds and an amplitude of about 10 mmHg to about 40 mmHg. The phenomenon is caused by self-oscillation of the sympathetic control system for the blood pressure with the baroreceptors as input signals. The autonomous system is also involved in temperature control of the body via regulation of the vasomotor response to temperature changes. At low temperatures e.g. the arterioles are contracted to conserve energy of the body, which cause higher blood pressure. Similar to the vasomotor oscillations caused by the blood pressure control system, the temperature control system also give rise to cyclic variations in blood pressure. The temperature cycle rate is normally centred at around 0.05 Hz. Fig. 5 shows the modulation 501 of a breathing signal 502 from the venous pressure signal measured by pressure sensor 4c of Fig. 11 due to oscillation of an autonomous control system in the frequency range of temperature regulation. 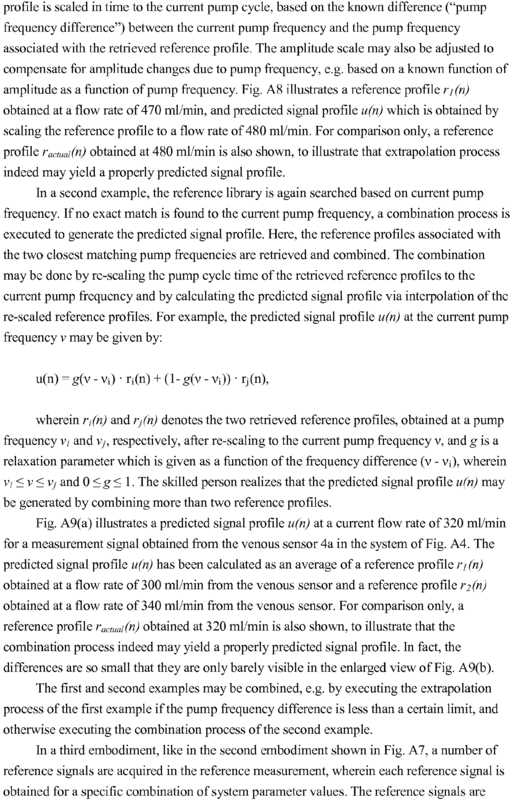 In the simplest case of pressure signal analysis, no pump or other source of pressure artefacts is present in the extracorporeal fluid circuit connected to the subject during the data acquisition. For instance, the pump may have been shut down. In the general case, however, one or more pumps are running or other sources of cyclic or non-cyclic, repetitive or non-repetitive artefacts are present during the data acquisition. Information on the cyclic disturbances may be known from external sources, e.g. other sensors or controllers, or may be estimated or reconstructed from system parameters, e.g. the blood flow rate. Cyclic pressure artefacts may originate from operating a peristaltic pump, repetitive actuation of valves, movements of membranes in balancing chambers. According to the findings in connection with the present invention, artefacts may also originate from mechanical resonance of system components such as swinging movements of blood line energized by e.g. a pump. Frequencies of blood line movements are given by the tube lengths and harmonics thereof and by the beating between any frequencies involved, i.e. between different self-oscillations and pump frequencies. These frequencies may differ between the venous and arterial lines. Mechanical fixation of the blood lines and other free components may remedy the problem of mechanical resonance. Alternatively, an operator may be instructed to touch or jolt the blood lines to identify natural frequencies associated with the blood lines, which information may be used in the analysis for improved removal of components not belonging to the pressure data of interest. Examples of non-cyclic artefacts are subject movement, valve actuation, movements of tubings, etc. In the following, various techniques for signal extraction (cf. 403 in Fig. 4) will be briefly discussed. In the following, embodiments for eliminating various artefacts will be described. Then, embodiments for isolating pressure data originating from a relevant physiological phenomenon are described. The pressure data to be extracted is not limited to a single physiological phenomenon and may originate from one or more physiological phenomena, excluding the heart. Artefacts from a pulse generator, such as a pumping device, in the extracorporeal blood flow circuit may be avoided by temporarily shutting down the pulse generator, or by shifting the frequency of the pulse generator away from frequencies of one or more relevant physiological phenomena. With specific reference to the use of the pressure data for integrity detection (cf. step 410 in Fig. 4), artefacts may be eliminated by feedback control with respect to the relevant physiological signal, e.g. a breathing signal, from an independent source, e.g. a capnograph instrument. Such feedback control may thus be used to set the pump frequency optimally for detection of the relevant physiological signal in the pressure signal. For example, control unit 23 of Fig. 11 may be operated to set the pump frequency based on an external signal in order to facilitate the detection of the relevant physiological signal, i.e. the pump frequency is controlled to minimize overlap in frequency between the pump and the physiological phenomenon of relevance. The measured signal may be fed into a filter, e.g. digital or analogue, with suitable frequency characteristics, such as frequency range and/or centre of frequency range, corresponding to a pulse generator, such as a pump, in the extracorporeal circuit. For instance, in a case where the pulse generator, such as a pump, operates within the frequency range of 1Hz., a suitable low pass filter may be applied in order to obtain the frequency of the physiological phenomenon below 1 Hz. Correspondingly, a high pass filter may be applied to obtain a physiological phenomenon with frequency higher than the pulse generator. With spectral analysis, detection and elimination of amplitude peaks in a spectrum may for instance be performed by Fast Fourier Transform (FFT) methods. 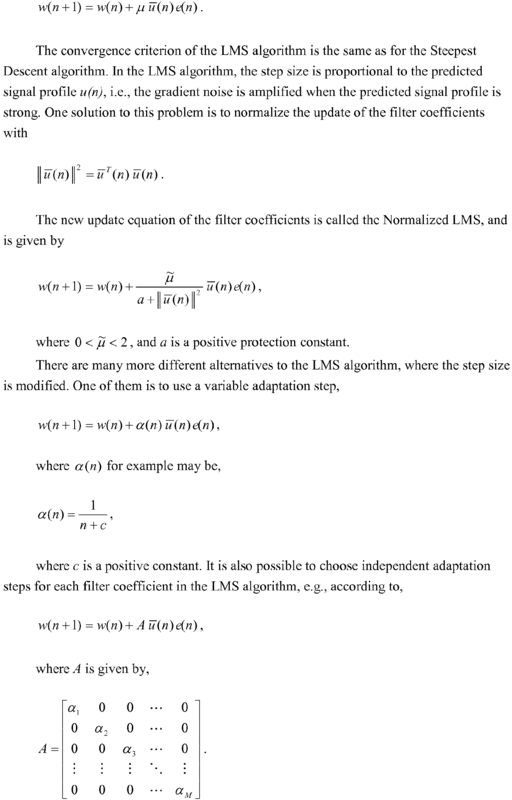 Alternatively, the elimination may be achieved by applying a notch filter or the like at one or more frequencies identified by an FFT method or the like. Artefact elimination by filtering in the time domain is further disclosed and exemplified in Appendix A. In addition to Appendix A, reference is also made to Applicant's PCT publication WO2009/156175 which is incorporated herein in its entirety by this reference. Temperature regulation due to the autonomous system, a frequency range of approx. 0.001 - 0.1 Hz will be allowed to pass the filter. The signal of interest may be extracted from the pressure signal as an error signal of an adaptive filter. The adaptive filter is fed with both the measurement signal and a predicted signal profile of a cyclic disturbance. The cyclic disturbance may originate from any unwanted physiological phenomenon (e.g. heart pulsation). Particularly, a reconstructed pressure profile originating from the heart may be input to the adaptive filter. This and other time domain filtering techniques for removing unwanted signal components from a measurement signal are further disclosed and exemplified in Appendix A. Although Appendix A is concerned with eliminating first pulses originating from a pulse generator in an extracorporeal circuit, such as a pumping device, it is equally applicable for eliminating first pulses originating from unwanted physiological phenomena, as long as a predicted signal profile of the first pulses may be obtained. The skilled person realizes that such a predicted signal profile may be obtained in any of the ways described in Appendix A. In addition to Appendix A, reference is also made to Applicant's PCT publication WO2009/156175 which is incorporated herein in its entirety by this reference. Some of the filtering techniques described above may automatically be achieved by down-sampling in the anti-aliasing filter included in a down-sampling signal processing algorithm. Additionally, some of the above described filtering techniques may also be achieved directly in hardware, e.g., in the Analogue-to-Digital conversion by choosing an appropriate sample frequency, i.e. due to the anti-aliasing filter which is applied before sampling. This section relates to detection, presenting, tracking and prediction of various physiological disorders, such as sleep apnea, hyperventilation, coughing etc (cf. 409 in Fig. 4). It is based on analysis of the physiological signal that is extracted out of a pressure signal acquired from an extra-corporeal fluid system. On a general level, the detection, presenting, tracking and prediction of physiological disorders may involve calculating an evaluation parameter value based on the isolated pressure data resulting from the aforesaid signal extraction. The evaluation parameter value is then analysed as part of a process for detecting a physiological disorder. As used herein, "tracking" denotes a process of continuously or intermittently determining/trending a physiological phenomenon as reflected by the isolated pressure data as such or by the absolute/relative parameter values extracted from the isolated pressure data. As used herein, "prediction of a disorder" may involve notifying the disorder in advance and/or estimating a risk for the disorder to exist or to emerge. 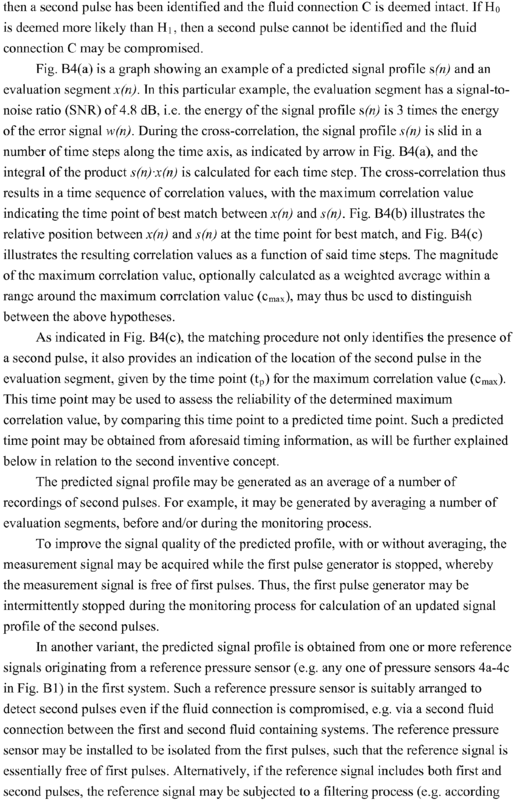 Different techniques for calculating such an evaluation parameter value are further disclosed and exemplified in Appendix B, in which the isolated pressure data corresponds to a time-dependent monitoring signal which is obtained by processing at least one measurement signal to essentially eliminate the first pulses (e.g. pump pulses) while retaining the second pulses (e.g. heart pulses). 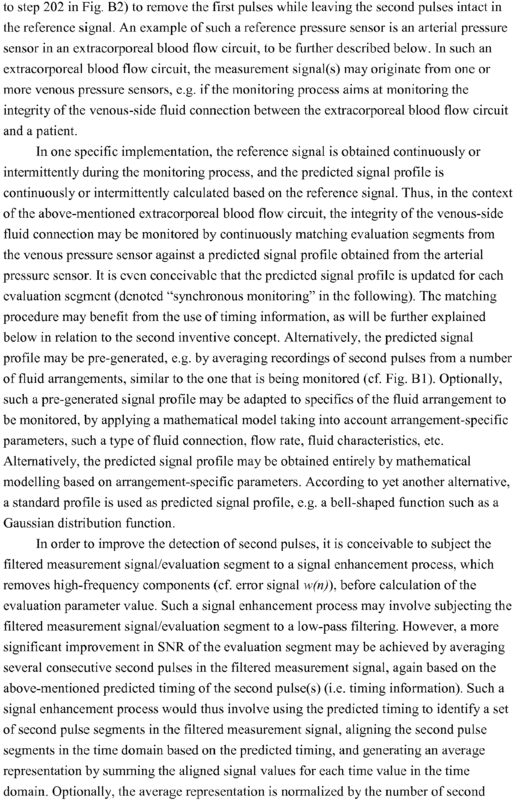 In Appendix B, the resulting time-dependent monitoring signal may be subjected to a time domain analysis which results in an evaluation parameter value that is used for monitoring the integrity of a fluid connection between the vascular system of a patient and an extracorporeal blood flow circuit. 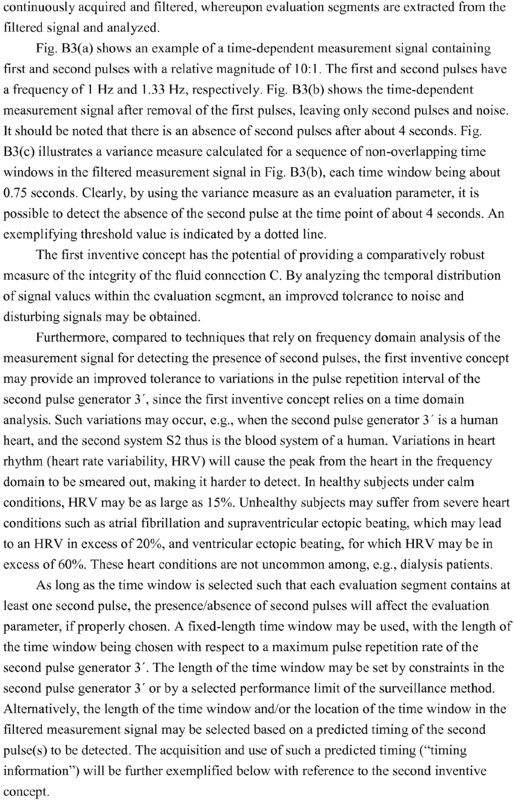 All techniques disclosed in Appendix B with respect to the signal processing and evaluation of heart pulses, including the use of timing information, are equally applicable for evaluating other physiological phenomena, such as breathing, autonomic regulation of body temperature, and autonomic regulation of blood pressure, or combinations thereof, for the purpose of detecting various physiological disorders. In addition to Appendix B, reference is also made to Applicant's PCT publication WO2009/156174 which is incorporated herein in its entirety by this reference. 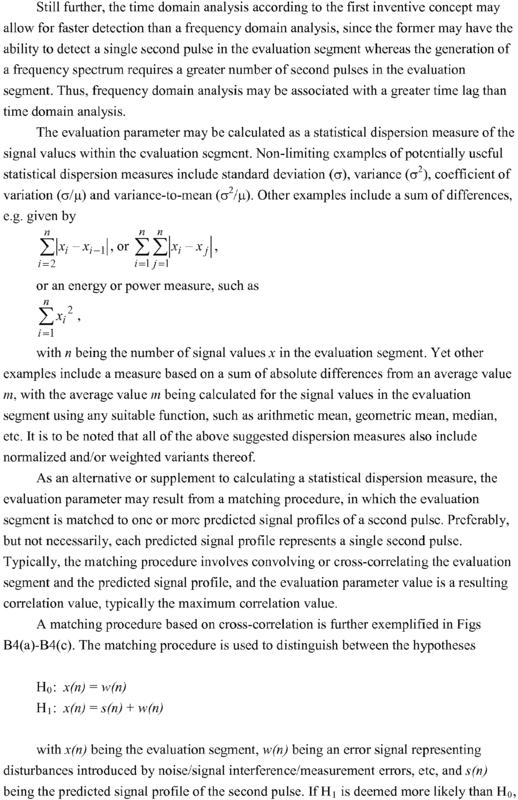 There are of course other techniques for calculating the evaluation parameter value, including other types of time domain analyses, as well as different types of frequency domain analyses, e.g. as indicated in the following. Other factors, such as the medical history of the patient, e.g. heart status, blood pressure and heart rate may also be utilized for improving the performance of the detection and monitoring of the various physiological disorders. The following sections describe a range of different physiological disorders that may be detected in arterial or venous pressure signals. Unless specifically mentioned, it is assumed that there is a medical interest of detecting or monitoring these disorders for diagnostic purposes, for safety and for surveillance. One breathing disorder is periodic breathing disorder, which means that a subject breathes deeply for some time in a repetitive manner and directly after that just slightly or not at all. One type of periodic breathing is called Cheyne-Stokes breathing. Fig. 6 shows an example of Cheyne-Stokes breathing 603, and also shows how the pressure P(CO2) 160 in the pulmonary (lung) blood and delayed changes in the pressure P(CO2) 162 of the fluids of the brain's respiratory centre excite the respiratory centre 605 which cause a situation of deep respiration 604. It may be caused by a too long delay for the transport of blood, e.g. due to cardiac failure, from the lungs to the respiratory centre of the brain to allow the feed-back control to work properly. Functional problems of the respiratory centre due to for instance brain damage may also be a reason for periodic breathing. The periodic breathing and the cycle thereof may according to the present invention be detected both in the time and frequency domain via e.g. filtering, envelop detection, e.g. Hilbert transform, or pattern matching. Other breathing disorders include apnea (or apnoea) which may be classified as stopped respiration for at least 10 seconds, and hypopnoea which may be classified as reduced respiration volume of ≥50%, but <100%, for at least 10 seconds with a ≥4% reduction of oxygen saturation of the blood. Hypopnea is a disorder which involves episodes of overly shallow breathing or an abnormally low respiratory rate. This differs from apnea in that there remains some flow of air. Hypopnea events may happen while asleep or while awake. Sleep apnea may be manifested as repetition of a certain breathing pattern. This may be seen in the three curves of Fig. 7 representing air flow 701, movements of thorax 702 and abdomen 703, respectively. Two main types of apnea are referred to as central and obstructive, denoted CA and OA in Fig. 7. N denotes normal breathing. Central apnea is caused by malfunction of the respiratory centre of the brain, whereas obstructive apnea is caused by blockage of the respiration path of the patient during sleep. By identifying this kind of pattern in the breathing signal provided from the pressure signal analysis, apnea may be detected. The detection criterion for sleep apnea or hypopnea may e.g. be defined as equal to or more than 5 episodes of apnoea or hypopnea per hour of sleep. Furthermore, patients in severe, life-threatening situations, e.g. after over-dosing of opiate-based medication or other Central Nervous System (CNS) depressant drugs, may stop respiration or reduce the respiration frequency markedly. Patients that are not observed constantly, e.g. patients performing home-dialysis treatments, may be helped out of dangerous situations if stopped breathing can be detected automatically. A detection criterion for hypoventilation may be rate-related, e.g. be set to the frequency range below normal breathing, e.g. approx. 0.15Hz, provided that this condition has prevailed at least for a period of certain length, e.g. approx. 30 s. Low amplitude of the breathing signal may also be used as an indicator of hypoventilation by itself or in combination with the rate-related detection criterion. Heart conditions, such as angina pectoris, left ventricular hypertrophy, stroke or congestive heart failure are sometimes expressed via irregular heart rhythm, ectopic beats and coughing. In case no surveillance of the heart is present, e.g. with electro-cardiogram (ECG), identification of coughing is often used as a clinical marker of heart conditions in dialysis patients. Intense coughing may also indicate infection or allergic reaction, which is also true for sneezing. Coughing and sneezing may influence physiological measurements obtained from external instruments, e.g. it is known that coughing will introduce errors in a PPG signal (e.g. measured with a pulse oximeter). Thus, detection of coughing or sneezing may also be used in correction procedures for errors and artefacts in other physiological measurements. For instance, it is known that coughing may induce false alarms in a PPG-based method for hypotension prediction. In embodiment of the present invention, detection of coughing and sneezing may thus also be used to reduce the number of false alarms in PPG-based methods for hypotension prediction. The cough and sneezing reflex comprises a rapid inspiration of air, up to 2.5 litres, followed by a forceful contraction of the abdominal and expiratory muscles causing a rapid increase of the pressure in the lungs (≥100 mmHg) before the air is expelled at high velocity. The lung pressure variations of the two phases inspiration and expiration cause corresponding changes of the blood pressure, which is seen in pressure measurements of an extra-corporeal circuit. Coughing and sneezing may e.g. be detected as a disruption of the normal breathing signal by non-cyclic pressure peaks larger than certain limits and with a duration within a certain range or by pattern matching to standardized or individualized pressure profiles representing coughing or sneezing. Patients in stressed conditions, e.g. suffering from a panic attack, may breathe at higher rate, which may result in hyperventilation. It may also occur as a consequence of various lung diseases, head injury, stroke and various respiration disorders, e.g. central neurogenic hyperventilation, apneustic respirations, ataxic respiration, Cheyne-Stokes respirations or Biot's respiration. Also, in the case of metabolic acidosis, the body uses hyperventilation as a compensatory mechanism to decrease acidity of the blood. Dialysis patients e.g. may suffer from acidosis which may trigger hyperventilation. Hyperventilation is linked with an increased risk for disturbances of the blood chemistry (pCO2, pH, and pO2), since it causes reduction of the carbon dioxide concentration of the blood to below its normal level, which, in turn, raises the blood's pH value, making it more alkaline. Alkaline blood chemistry may initiate constriction of the blood vessels which supply the brain and may prevent the transport of certain electrolytes necessary for the function of the nervous system. Hyperventilation may, but does not always, cause symptoms such as numbness or tingling in the hands, feet and lips, lightheadedness, dizziness, headache, chest pain, slurred speech and sometimes fainting. Hyperventilation may e.g. be indicated if the rate of the breathing signal generated from pressure analysis is higher than the normal upper range, e.g. approx. 0.4 Hz and in particular approx. 0.8 Hz. Asthmatic attacks are caused by congestion in the pulmonary tract, which particularly reduces the ability of a subject to exhaust air from its lungs. The flow and the rate of ventilation are decreased while breathing effort is increased. The respiration cycle is therefore clearly disturbed, which may be detected as an abnormal breathing rate with e.g. relatively shorter inspiration compared to expiration. The unusually high pressure amplitude during the extended expiration phase may also be used for detecting asthmatic attacks. A further disorder which may be detected in one embodiment of the present invention is epilepsy, which is a common chronic neurological disorder characterized by recurrent unprovoked seizures. These seizures are transient signs and/or symptoms of abnormal, excessive or synchronous neuronal activity in the brain. Seizures can cause involuntary changes in body movement or function, sensation, awareness, or behaviour. Specifically it may include series of involuntary muscular contractions due to sudden stretching of the muscle. These may affect the blood pressure of the subject (e.g. by elevation or rhythmic modulation) which in turn may change the venous and arterial pressure in the extracorporeal circuit. A seizure can last from a few seconds to status epilepticus, a severe condition with a continuous seizure that will not stop without intervention. It is clear that regular respiration is disrupted also when the subject is talking or is having a meal. The corresponding measurement/breathing signals do not show a definite pattern, however it may e.g. be detected by statistical pattern analysis with multivariate statistical methods or with additional signal extraction, external or internal, e.g. with a microphone or a blood volume sensor (it is known that blood volume is reduced in response to food intake). Detection of speech or food intake may be done so as to prevent that the measurement signal is used for detecting a disorder during such speech/food intake. Alternatively or additionally, the presence of speech can be detected by analysing the measurement signal in the frequency region above about 3.5-4 Hz, typically above about 100 Hz. For increased certainty, it may be required that corresponding speech signals are found in measurement signals from plural pressure sensors, e.g. the arterial and venous pressure sensors 4a, 4c in Fig. 4. The signal levels in the arterial and venous pressure signals may change rapidly due to other physiological mechanisms. Contraction of the abdominal muscles causes increase of blood pressure and consequently also an intermittent rise in the signal levels of the arterial and venous pressure signals. A medically relevant example of this is vomiting, which may be identified as a deep breath followed by forceful contractions of the abdominal muscles and lowering of the diaphragm. Detection of severe repetitive hiccups may also be of interest. These kind of reflex-controlled phenomena have typical patterns which allow detection by matching to standard patterns. A disorder that is detected during dialysis, in particular nocturnal dialysis, may be automatically communicated to the clinical staff directly or stored in a computer system for off-line monitoring, diagnosing or statistical purposes. It may also be provided as feedback directly to the patient, medical staff and/or machine system to counteract the disorder. For instance, if the patient cannot constantly be observed during e.g. a dialysis treatment it may be beneficial to identify a deviating breathing pattern such as coughing apnea or epilepsy via automatic detection in the dialysis machine. The medical staff may be notified directly via an alert signal or indirectly as information sent by a communication channel, such as to a server for subsequent retrieval. An alert or alarm may be issued on detection of a deviation from a normal physiological pattern, such as breathing, of a patient, for instance when the duration of an asthmatic attack, coughing or apnea exceeds a predetermined limit or if vomiting is detected. An embodiment of the present invention further relates to a method for detecting ectopic heart beats accompanied by Blood Pressure Turbulence (BPT) events by monitoring of the physiological signal generated by signal extraction processing of the pressure signal(s) acquired continuously from an extracorporeal circuit. Hence, there is no need for external instruments for blood pressure measurements to detect BPT events, nor is external instruments for heart monitoring needed for counting the presence of ectopic beats (also denoted EBC) which generate the BPT event. The blood pressure of a subject is modulated directly after a ventricular ectopic beat (VEB) episode. Fig. 8 shows the blood pressure response after a VEB, i.e. Blood Pressure (BP) response 801 to a VEB in a healthy subject and blood pressure response 802 to a VEB in a patient with idiopathic dilated cardiomyopathy. Fig. 9 shows an event of BPT taking place during a dialysis treatment. A capnography device is used for providing a reference or benchmark signal of breathing PB, and a reference or benchmark signal of heart pulsations PH is generated by a pulse oximeter. Signal extraction processing of a venous pressure signal from the extracorporeal circuit results in a pressure signal PV which isolates pressure data that originates from the breathing system and the autonomous system for blood pressure regulation in the patient. A VEB, indicated with an arrow in Fig. 9, is seen as a prolonged delay between the normal beats of the heart. A sequence of pressure turbulence comes immediately after the VEB and can be identified in the isolated pressure signal PV. To be more precise, the isolated pressure signal PV will reflect breathing up until the time of the VEB. After the VEB, the isolated pressure signal PV will reflect the combined effects of breathing and BPT, and after the BPT event has faded away (after about 15 seconds in Fig. 9), only breathing remains. Fig. 9 illustrates that BPT events can be detected in the isolated pressure signal PV, even in the presence of a breathing signal. It is to be understood that the venous pressure signal may be processed for removal of the breathing signal as well, to isolate only pressure data from the autonomous system for blood pressure regulation. Fig. 10 illustrates isolated pressure signals PV, PA obtained during a BPT-event by signal extraction processing of a venous pressure signal and an arterial pressure signal, respectively, from pressure sensors in an extracorporeal circuit. As shown, the isolated pressure signals comprise both breathing and BPT components. This figure illustrates that pressure measurements from both the venous and arterial sites may be used for detecting BPT-events during extra-corporeal circulation. Optionally, the BPT component may be isolated by removing the breathing component. By band-pass filtering of the venous and/or the arterial pressure signals, since the spectral content of BPT is in the low frequency range of approx. 0.04-0.15 Hz, with frequencies typically centred around approx. 0.1 Hz. By correlation of one or more isolated pressure signals PV, PA (which, e.g., may isolate pressure data originating from the autonomous system for blood pressure regulation, and possibly also the breathing system) with a standardized pressure profile of a BPT event. If the correlation coefficient is larger than a certain limit, a BPT event is detected. By averaging isolated pressure data (which, e.g., may originate from the autonomous system for blood pressure regulation, and possibly also the breathing system) after several different VEBs. The averaging may involve combining (adding) isolated pressure signals obtained from plural pressure sensors (e.g. the arterial and venous pressure sensors 4a, 4c in Fig. 4), or combining (adding) sequential segments in one isolated pressure signal. Detection of BPT events may be useful for determining occurrence and rate of ectopic beats (i.e., EBC) as an indicator of the patient's heart condition. It has also been shown that EBC may be used for detecting/predicting dialysis induced hypotension. By finding the timing of a VEB in another signal than the isolated pressure signals PV and PA (e.g., in the heart pulsations PH), it may be possible to detect impaired or lack of autonomic blood pressure regulation. This may be accomplished by evaluating the magnitude of the BPT event that follows the VEB. Furthermore, it has been shown that, dialysis patients with reduced BPT (i.e., impaired or lack of autonomic blood pressure regulation) are prone to dialysis induced hypotension, whereas dialysis patients with more normal BPT events are resistant to hypotension. Clinically, it may be advantageous to be able to classify dialysis patients in this manner. Detection of impaired or lack of all different kinds of autonomic regulations, not only blood pressure regulation, are of medical interest. In addition, magnified or overcompensated autonomic regulation (in contrast to impaired or lack of) are also of medical interest. The status of the autonomic regulation (i.e., impaired, lack of, magnified or overcompensated) may, e.g., be detected by comparing the actual autonomic regulation to a threshold (and/or a pattern) of the different status. Embodiments of the invention further relates to an apparatus, a method and a computer-implemented method for detecting disconnection of an extracorporeal circuit from a subject based on analysis of signals originating from a physiological phenomenon, such as breathing and/or autonomous regulation in the body of the subject. Turning to Fig. 11, and as discussed by way of introduction, it may be vital to monitor the integrity of the connection of the access device 1, 14 to the blood vessel access with respect to malfunction in the injection and/or extraction of blood there through. In many dialysis machines, one or more of the pressure detectors 4a-4c are not present. In one embodiment of the invention, the integrity of the fluid connection between the blood vessel access and the venous access device 14 is monitored based on a measurement signal from the venous pressure sensor 4c. Further, in Fig. 11, the surveillance/monitoring device 25 is configured to monitor the integrity of a venous-side fluid connection between the patient and the extracorporeal blood flow circuit 20, specifically by monitoring the presence of a signal component originating from a physiological phenomenon other than the heart of the patient. Absence of such a signal component is taken as an indication of a failure in the integrity of the fluid connection, e.g. that the venous access device 14 is dislodged from the blood vessel access, and brings the device 25 to activate an alarm and/or stop the blood flow, e.g. by stopping the blood pump 3 and activating a clamping device 13 on tube segment 12. The surveillance device 25 is at least connected to receive a measurement signal of the pressure sensor 4c. The device 25 may also be connected to pressure sensors 4a, 4b, as well as any additional sensors included in or attached to the extracorporeal blood flow circuit 20, such as further pressure sensors (4a, 4b in Fig. 11) or a dedicated breathing sensor, e.g. a capnography instrument. As indicated in Fig. 11, the device 25 may also be connected to the control unit 23. Alternatively or additionally, the device 25 may be connected to a measurement device 26 for indicating the frequency and phase of the blood pump 3. The device 25 is tethered or wirelessly connected to a local or remote device 27 for generating an audible/visual/tactile alarm or warning signal. The surveillance device 25 and/or the alarm device 27 may alternatively be incorporated as part of a dialysis apparatus. In the event of a dislodgement of the venous access device 14, the pathway of all physiological signals from the subject to any sensor of the corresponding side of the extracorporeal circuit 20 is disrupted. This may be detected directly after a short delay needed by the signal analysis algorithm to assert certainty of the conclusion. The integrity of a fluid connection may be monitored by detecting transmission of a pressure wave across the fluid connection. There is thus a pressure wave generator on one side of the fluid connection and a detection device on the other side. In an embodiment, the patient's breathing system is used as the pressure wave generator whilst a pressure sensor is arranged on the other side of the fluid connection, e.g. in the tube segment which leads from a access device 1, 14 and further into the extracorporeal circuit 20. In further embodiments, the patient's reflexes, voluntary muscle contractions, non-voluntary muscle contractions, the autonomous system of the patient for blood pressure regulation or the autonomous system of the patient for body temperature regulation may be used as the pressure wave generator. In yet further embodiments, the detection of speech is used for monitoring the integrity of the fluid connection. The presence of speech can be detected by analysing the measurement signal in the frequency region above about 3.5-4 Hz, typically above about 100 Hz. Thus, the integrity of the fluid connection is determined based in the presence or absence of pressure pulses originating from a relevant physiological phenomenon in the patient, excluding the heart. 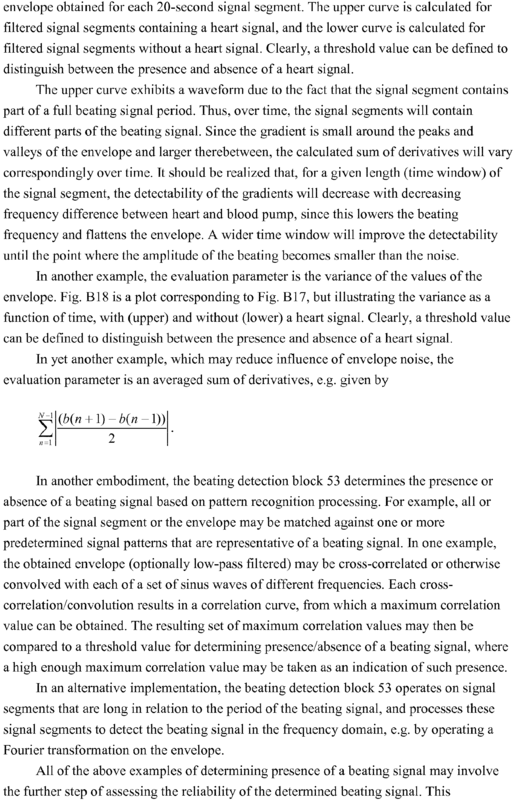 The assessment of presence or absence may involve calculating an evaluation parameter value based on the isolated pressure data resulting from the aforesaid signal extraction, and comparing the evaluation parameter value to a threshold value. Different techniques for calculating such an evaluation parameter value are further disclosed and exemplified in Appendix B. As noted above, all techniques disclosed in Appendix B with respect to the extraction, signal processing and evaluation of heart pulses are equally applicable to other physiological phenomena, such as breathing, autonomic regulation of body temperature, and autonomic regulation of blood pressure, or combinations thereof. In addition to Appendix B, reference is also made to Applicant's PCT publication WO2009/0156174 which is incorporated herein in its entirety by this reference. It may be emphasized that the above-mentioned dedicated breathing sensor may be used to provide the timing information that may be used for calculating the evaluation parameter value as taught by Appendix B. In alternative embodiments, the evaluation parameter value is calculated based on a frequency domain analysis of the isolated pressure data, e.g. by finding an amplitude peak in an FFT spectrum. In still other embodiments, also described in Appendix B, when the isolated pressure data includes pressure artefacts from a pulse generator in the extracorporeal circuit, presence and absence of pressure pulses originating from the relevant physiological phenomenon in the patient is detected via beatings, i.e. amplitude modulations, in the isolated pressure data formed by interference between pressure waves generated by the relevant physiological phenomenon and pressure waves generated by the pulse generator. Hence, instead of trying to isolate a signal component generated by the relevant physiological phenomenon in the isolated pressure data, the presence of such a signal component is thus identified via the secondary effect of beating. Generally, beating is a phenomenon which is especially noticeable when two signals with closely spaced frequencies are added together. Thus, the beating signal detection is inherently well-suited to be used when other techniques fails, for instance when the frequency of the relevant physiological phenomenon lies close to a frequency component of the pulse generator, e.g. a pumping device in the extracorporeal circuit. To avoid an overlapping frequency of the pump and the physiological signal, which may make detection more difficult, the appropriate physiological signal may be chosen depending on the actual pump rate, or the pump frequency may be changed depending on the frequency of the relevant/chosen physiological phenomenon. For example, with a peristaltic blood pump of a typical dialysis machine (~5 ml/pump stroke), the breathing signal would be applicable for blood flow rates substantially in the range of >120 ml/min (i.e. >0.4 Hz) and <45 ml/min (i.e. <0.15Hz). The autonomous signals would in that case be suitable for blood flow rates >45 ml/min. This means that more than one physiological signal may be suitable for detection of access device dislodgement in some frequency intervals. Note that a heart signal, e.g. isolated in accordance with Appendix A and processed in accordance with Appendix B, may be used for dislodgement detection in combination with any of the other physiological signals. Thus, the surveillance device 25 may be configured to actively switch, e.g. based on the blood flow rate or the pump frequency, between different detection modes so as to avoid frequency overlaps, where the different modes may involve isolating pressure data from different physiological phenomena and detecting dislodgement based on absence/presence of a signal component originating from the relevant physiological phenomenon. The acceptable detection time for dislodgement detection depends on maximum acceptable blood loss and actual blood flow. This means that detection of fluid connection integrity by e.g. breathing or autonomous signals may not be applicable at blood flows higher than an upper limit. Assuming, for example, that the maximum blood loss is 200 ml from dislodgement of the venous access device to detection and that the detection time by autonomous signal is 120 seconds, the acceptable blood flow in that case must be less than approx. 100 ml/min. In the above-described embodiments, all or part of the functionality of the surveillance/monitoring device 25, including data acquisition part 28 and main processing part 29, may be provided by dedicated hardware and/or by special-purpose software (or firmware) run on one or more general-purpose or special-purpose computing devices. In this context, it is to be understood that each "element" or "means" of such a computing device refers to a conceptual equivalent of a method step; there is not always a one-to-one correspondence between elements/means and particular pieces of hardware or software routines. One piece of hardware sometimes comprises different means/elements. For example, a processing unit serves as one element/means when executing one instruction, but serves as another element/means when executing another instruction. In addition, one element/means may be implemented by one instruction in some cases, but by a plurality of instructions in some other cases. Such a software controlled computing device may include one or more processing units, e.g. a CPU ("Central Processing Unit"), a DSP ("Digital Signal Processor"), an ASIC ("Application-Specific Integrated Circuit"), discrete analog and/or digital components, or some other programmable logical device, such as an FPGA ("Field Programmable Gate Array"). The computing device may further include a system memory and a system bus that couples various system components including the system memory to the processing unit. The system bus may be any of several types of bus structures including a memory bus or memory controller, a peripheral bus, and a local bus using any of a variety of bus architectures. The system memory may include computer storage media in the form of volatile and/or non-volatile memory such as read only memory (ROM), random access memory (RAM) and flash memory. The special-purpose software may be stored in the system memory, or on other removable/non-removable volatile/non-volatile computer storage media which is included in or accessible to the computing device, such as magnetic media, optical media, flash memory cards, digital tape, solid state RAM, solid state ROM, etc. The computing device may include one or more communication interfaces, such as a serial interface, a parallel interface, a USB interface, a wireless interface, a network adapter, etc, as well as one or more data acquisition devices, such as an A/D converter. The special-purpose software may be provided to the computing device on any suitable computer-readable medium, including a record medium, a read-only memory, or an electrical carrier signal. It should be understood that various changes and modifications to the presently preferred embodiments described herein will be apparent to those skilled in the art. Such changes and modifications may be made without departing from the spirit and scope of the present invention and without diminishing its attendant advantages. It is therefore intended that such changes and modifications be covered by the appended claims. References within this text to a, an, one and first should be construed as one or more. In the following, a set of items are recited to summarize some aspects and embodiments of the invention as disclosed in the foregoing, possibly taken in combination with the content of the Appendixes A and B. 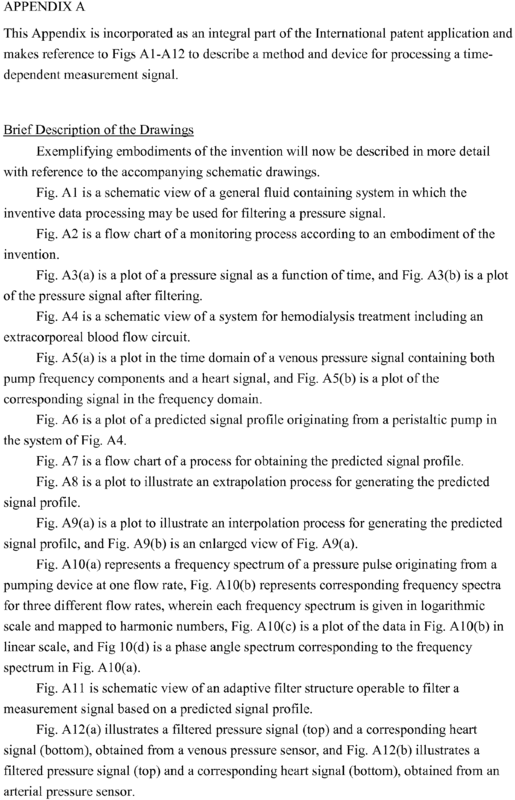 Item 1: A method for processing a measurement signal obtained by a pressure sensor (4a-4c) in an extracorporeal fluid system (S1) connected to a vascular system (S2) of a subject, said method comprising: receiving the measurement signal; and processing the measurement signal for identification of pressure data originating from a first physiological phenomenon in said subject, said physiological phenomenon excluding the heart of said subject. Item 2: The method of item 1, wherein said physiological phenomenon is included in the group consisting of reflexes, voluntary muscle contractions, non-voluntary muscle contractions, a breathing system of said subject, an autonomous system of said subject for blood pressure regulation and an autonomous system of said subject for body temperature regulation. 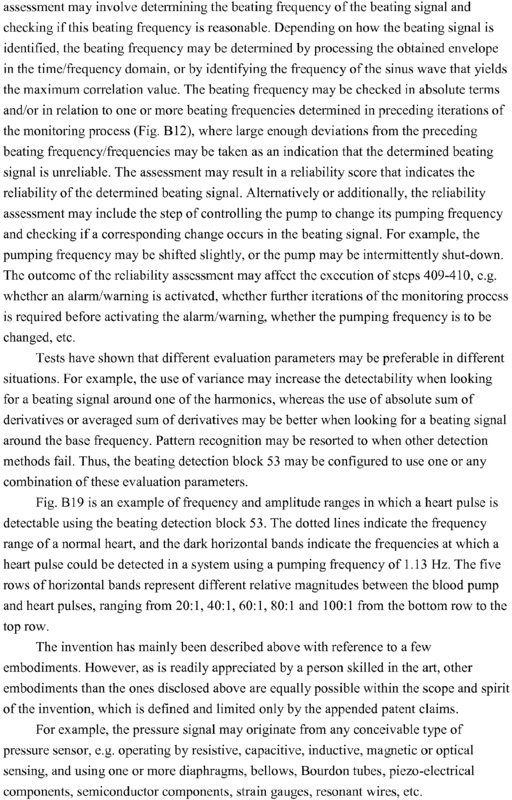 Item 3: The method of item 1, wherein said physiological phenomenon is a repetitive physiological pulse generator. Item 4: The method of any of items 1-3, wherein the step of processing involves filtering the measurement signal in the frequency domain. Item 5: The method of any of items 1-4, wherein the step of processing involves filtering the measurement signal to remove frequencies above about 0.5 Hz. Alternatively or additionally, the step of processing may involve filtering the measurement signal to remove frequencies below about 3.5 Hz. Item 6: The method of item 5, wherein the measurement signal is filtered with respect to at least one frequency range included in the group consisting of about 0.15 Hz to about 0.4 Hz, about 0.04 Hz to about 0.15Hz, and about 0.001Hz to about 0.1 Hz. Item 7: The method of any of items 1-6, wherein the extracorporeal fluid system (S1) is associated with a mechanical pulse generator (3), wherein the pressure sensor (4a-4c) is arranged in the extracorporeal fluid system (S1) to detect a first pulse originating from the mechanical pulse generator (3) and a second pulse originating from said physiological phenomenon. Item 8: The method of item 7, said method comprising: controlling the mechanical pulse generator (3) so as to separate the first and second pulses in the time and/or frequency domain. 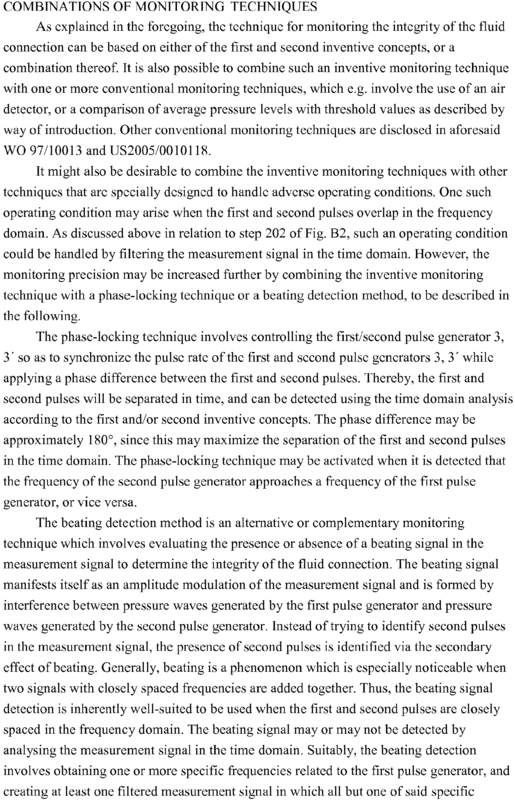 Item 9: The method of item 7, said method comprising: intermittently turning off the mechanical pulse generator (3) while obtaining the measurement signal. 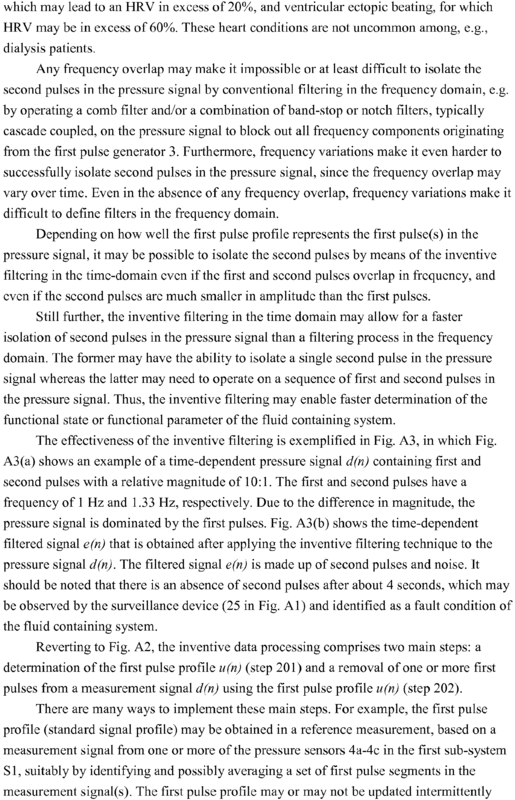 Item 10: The method of item 7, said method comprising: obtaining a first pulse profile (u(n)) which is a predicted temporal signal profile of the first pulse, and filtering the measurement signal in the time-domain, using the first pulse profile (u(n)), to essentially eliminate the first pulse while retaining the second pulse. Item 11: The method of item 10, wherein the step of filtering comprises subtracting the first pulse profile (u(n)) from the measurement signal. 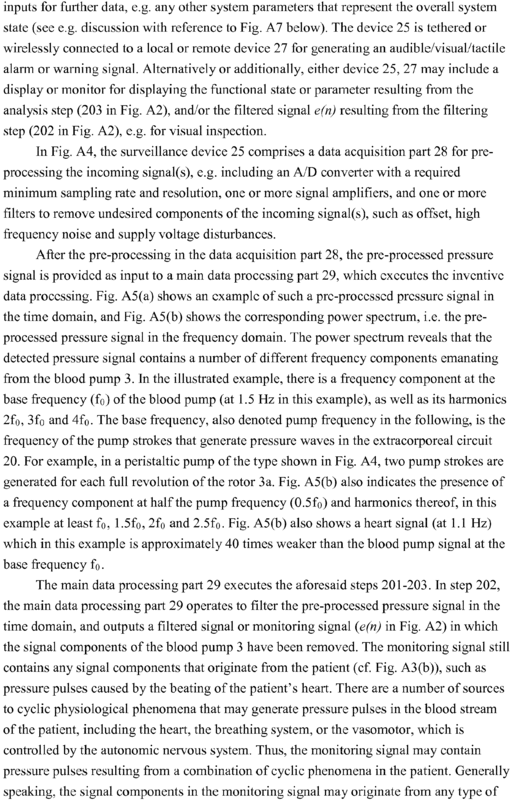 Item 12: The method of item 11, wherein step of subtracting comprises adjusting a phase of the first pulse profile (u(n)) in relation to the measurement signal, wherein said phase is indicated by phase information obtained from a phase sensor (26) coupled to the mechanical pulse generator (3), or from a control unit (23) for the mechanical pulse generator (3). The step of subtracting may also comprise adjusting an amplitude of the first pulse profile in relation to the measurement signal. Item 13: The method of any one of items 10-12, wherein the first pulse profile (u(n)) is obtained in a reference measurement in said extracorporeal fluid system (S1), wherein the reference measurement comprises the steps of: operating the mechanical pulse generator (3) to generate at least one first pulse, and obtaining the first pulse profile (u(n)) from a reference signal generated by a reference pressure sensor (4a-4c) in the extracorporeal fluid system (S1). Item 14: The method of item 13, wherein the mechanical pulse generator (3) is operated to generate a sequence of first pulses during the reference measurement, and wherein the first pulse profile (u(n)) is obtained by identifying and averaging a set of first pulse segments in the reference signal. Item 15: The method of item 13 or 14, wherein the reference measurement is effected intermittently during operation of the extracorporeal fluid system (S1) to provide an updated first pulse profile (u(n)). Item 16: The method of any one of items 13-15, wherein the pressure sensor (4a-4c) is used as said reference pressure sensor. Item 17: The method of any one of items 10-12, wherein the step of obtaining comprises obtaining a predetermined signal profile. 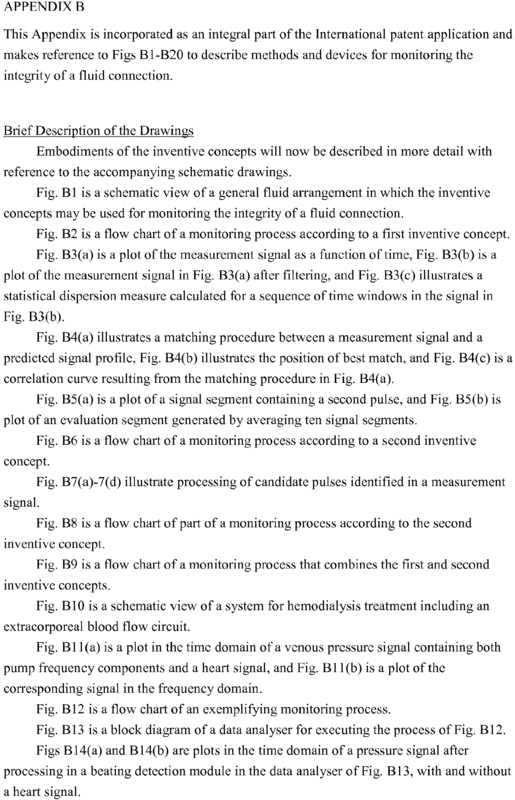 Item 18: The method of item 17, wherein the step of obtaining further comprises modifying the predetermined signal profile according to a mathematical model based on a current value of one or more system parameters of the extracorporeal fluid system (S1). Item 19: The method of any one of items 13-16, wherein the extracorporeal fluid system (S1) is operated, during the reference measurement, such that the reference signal contains a first pulse and no second pulse. Item 20: The method of any one of items 13-16, wherein the reference measurement comprises: obtaining a combined pulse profile based on a first reference signal containing a first pulse and a second pulse; obtaining a second pulse profile based on a second reference signal containing a second pulse and no first pulse, and obtaining the predicted signal profile by subtracting the second pulse profile from the combined pulse profile. Item 21: The method of item 20, further comprising the step of obtaining a current value of one or more system parameters of the extracorporeal fluid system (S1), wherein the first pulse profile (u(n)) is obtained as a function of the current value. Item 22: The method of item 21, wherein said step of obtaining the first pulse profile (u(n)) comprises: identifying, based on the current value, one or more reference profiles (r1(n), r2(n)) in a reference database; and obtaining the first pulse profile (u(n)) based on said one or more reference profiles (r1(n), r2(n)). Item 23: The method of item 22, wherein said one or more system parameters is indicative of the rate of first pulses in the extracorporeal fluid system (S1). Item 24: The method of item 23, wherein the mechanical pulse generator (3) comprises a pumping device and the system parameter is indicative of a pump frequency of the pumping device. Item 25: The method of any one of items 22-24, wherein each reference profile (r1(n), r2(n)) in the reference database is obtained by a reference measurement in the extracorporeal fluid system (S1) for a respective value of said one or more system parameters. 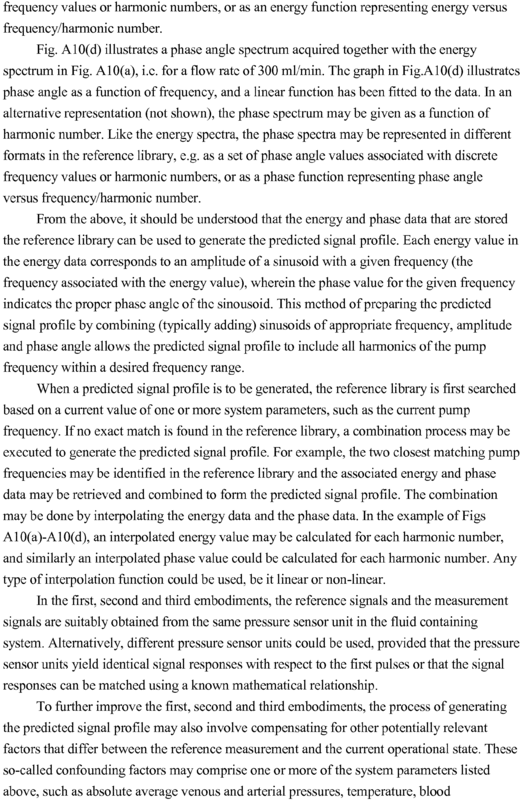 Item 26: The method of item 21, wherein said step of obtaining the first pulse profile (u(n)) comprises: identifying, based on the current value, one or more combinations of energy and phase angle data in a reference database; and obtaining the first pulse profile (u(n)) based on said one or more combinations of energy and phase angle data. Item 27: The method of item 26, wherein the first pulse profile (u(n)) is obtained by combining a set of sinusoids of different frequencies, wherein the amplitude and phase angle of each sinousoid is given by said one or more combinations of energy and phase angle data. Item 28: The method of item 21, wherein said step of obtaining the first pulse profile (u(n)) comprises: inputting the current value into an algorithm which calculates the response of the pressure sensor (4a-4c) based on a mathematical model of the extracorporeal fluid system (S1). Item 29: The method of any one of items 10-28, wherein the step of filtering comprises subtracting the first pulse profile (u(n)) from the measurement signal, and wherein the step of subtracting is preceded by an adjustment step, in which at least one of the amplitude, the time scale and the phase of the first pulse profile (u(n)) is adjusted with respect to the measurement signal. Item 30: The method of item 29, wherein the adjustment step comprises minimizing a difference between the first pulse profile (u(n)) and the measurement signal. Item 31: The method of items 10-28, wherein the step of filtering comprises: supplying the first pulse profile (u(n)) as input to an adaptive filter (30); calculating an error signal (e(n)) between the measurement signal and an output signal (d̂(n)) of the adaptive filter (30); and providing the error signal (e(n)) as input to the adaptive filter (30), whereby the adaptive filter (30) is arranged to essentially eliminate the first pulse in the error signal (e(n)). Further, the adaptive filter (30) may generate the output signal as a linear combination of M shifted first pulse profiles, specifically with the linear combination being formed by the adaptive filter (30) adjusting the amplitude and phase of M instances of the first pulse profile. 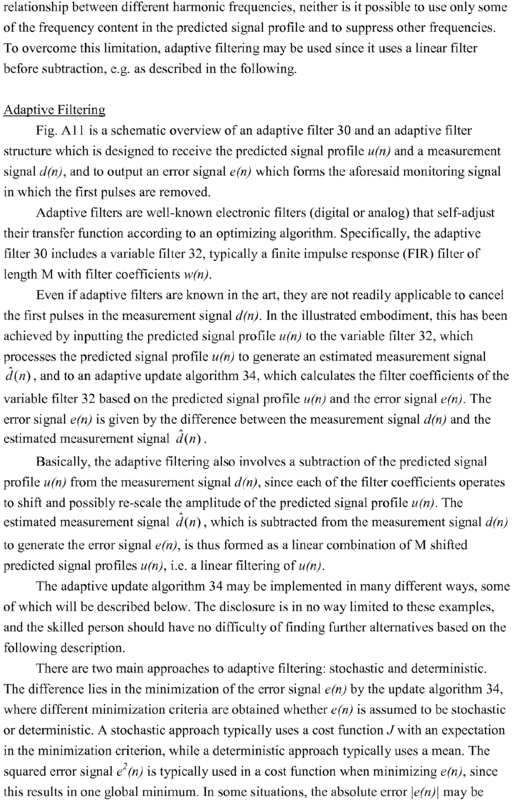 Item 32: The method of item 31, wherein the adaptive filter (30) comprises a finite impulse response filter (32) with filter coefficients that operate on the first pulse profile (u(n)) to generate the output signal (d̂(n)), and an adaptive algorithm (34) which optimizes the filter coefficients as a function of the error signal (e(n)) and the first pulse profile (u(n)). Item 33: The method of item 31 or 32, further comprising the step of controlling the adaptive filter (30) to lock the filter coefficients, based on a comparison of the rate and/or amplitude of the second pulses to a limit value. Item 34: The method of any of items 1-6, wherein said pressure data is a time-dependent monitoring signal including second pulses originating from said physiological phenomenon, said method further comprising: obtaining a reference pressure signal from a reference sensor in the extracorporeal fluid system (S1); identifying at least one second pulse in the reference pressure signal; calculating an estimated difference in arrival time between the reference sensor and said at least one pressure sensor (4a-4c) based on a difference in fluid pressure between the location of the reference sensor and said at least one pressure sensor (4a-4c); and processing the monitoring signal based on the estimated difference in arrival time. Item 35: The method of item 34, further comprising the steps of calculating a magnitude value indicative of the magnitude of said at least one second pulse in the reference pressure signal, and comparing the magnitude value to a limit, wherein the step of calculating an estimated difference in arrival time is conditioned upon said step of comparing. Item 36: The method of any of items 1-35, wherein said processing involves one or more of detecting, tracking and predicting a disordered condition of the subject using said pressure data. Item 37: The method of item 36, wherein the disordered condition comprises one or more of sneezing, hiccups, vomiting, coughing, blood pressure turbulence, ectopic beats, lack of autonomous regulation, hypotension, disordered breathing, sleep apnea, periodic breathing, hyperventilation, asthmatic attacks, dyspnea, and Cheyne-Stokes respiration. Item 38: The method of item 36 or 37, wherein said pressure data is a time-dependent monitoring signal including second pulses originating from said physiological phenomenon, said method further comprising: obtaining timing information indicative of the timing of the second pulses in the monitoring signal; processing the monitoring signal based on the timing information, to calculate a parameter value indicative of the second pulses; and analysing the parameter value for detection of the disordered condition. 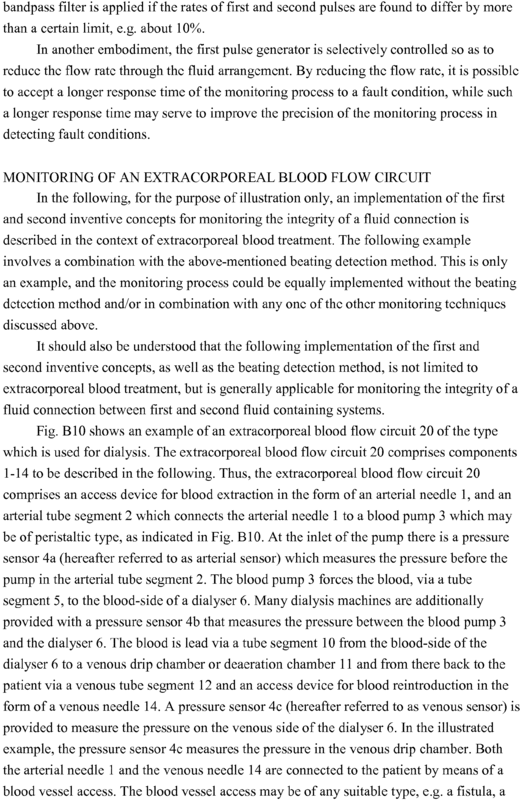 Item 39: The method of any one of items 1-6, further comprising monitoring the integrity of a fluid connection between said extracorporeal fluid system (S1) and said vascular system (S2) based on said pressure data. 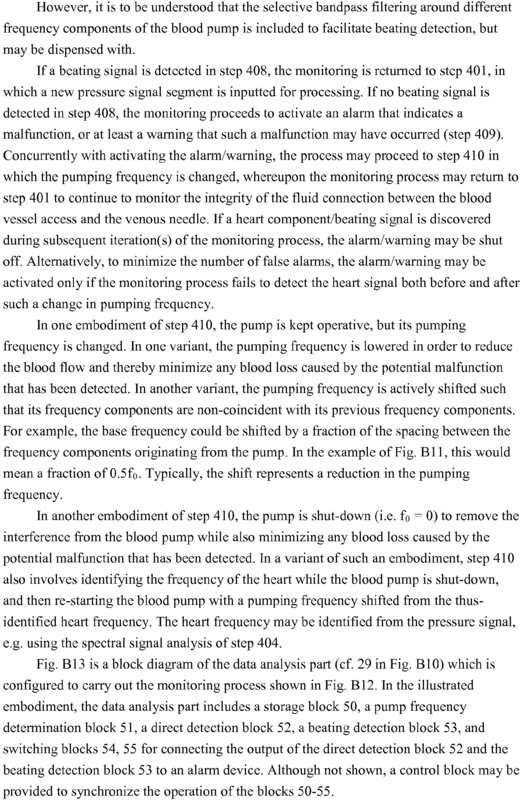 Item 40: The method of item 39, wherein the extracorporeal fluid system (S1) is associated with a mechanical pulse generator (3), wherein the pressure sensor (4a-4c) is arranged in the extracorporeal fluid system (S1) to detect a first pulse originating from the mechanical pulse generator (3) and a second pulse originating from said physiological phenomenon, and wherein said pressure data is a time-dependent monitoring signal including second pulses originating from said physiological phenomenon, said method further comprising calculating a parameter value based on signal values within a time window in the monitoring signal, the parameter value representing a distribution of the signal values; and determining the integrity of the fluid connection (C) based at least partly on the parameter value. Item 41: The method of item 40, wherein said calculating comprises: calculating the parameter value as a statistical dispersion measure of the signal values within the time window. Item 42: The method of item 41, wherein the statistical dispersion measure includes at least one of: a standard deviation, a variance, a coefficient of variation, a sum of differences, an energy, a power, a sum of absolute deviations from an average value, and an average of absolute differences from an average value. 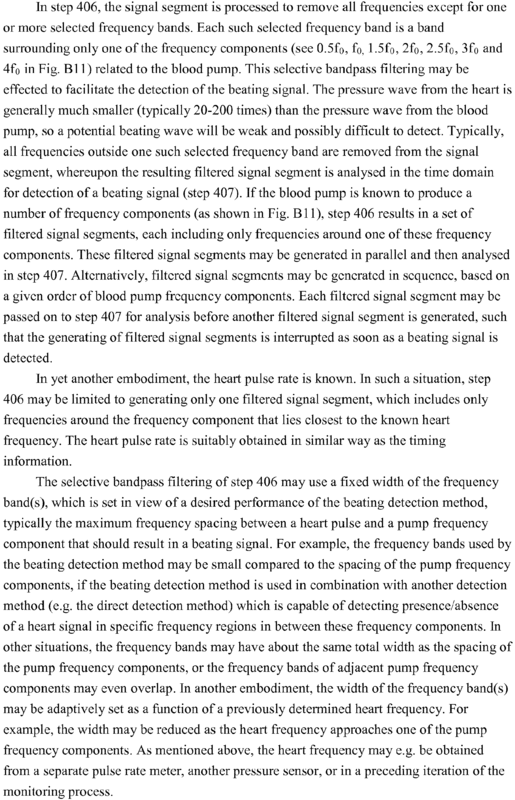 Item 43: The method of item 40, wherein said calculating comprises: matching the signal values within the time window to a predicted temporal signal profile of a second pulse. Item 44: The method of item 43, wherein the parameter value is a correlation value resulting from said matching. 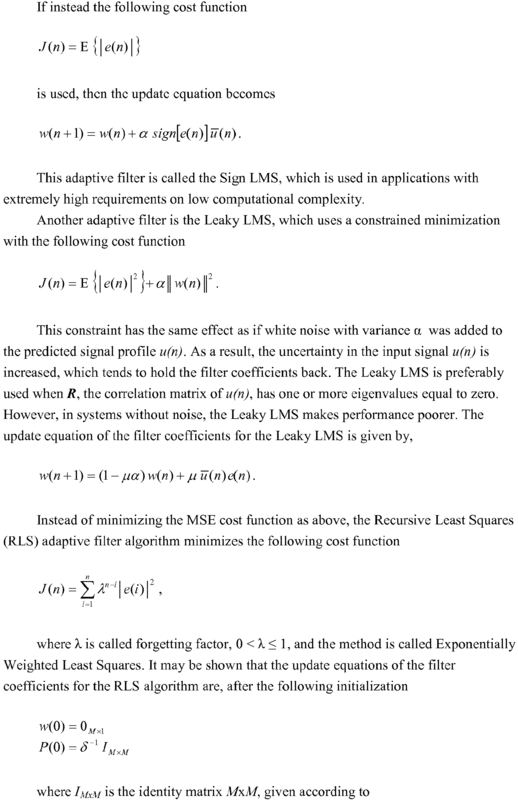 Item 45: The method of item 43 or 44, wherein said calculating comprises: calculating a cross-correlation between the signal values within the time window and the predicted temporal signal profile; and identifying a maximum correlation value in the cross-correlation; wherein said determining comprises: comparing the maximum correlation value to a threshold value. Item 46: The method of item 45, wherein said calculating comprises: obtaining a time point of the maximum correlation value, and validating the maximum correlation value by comparing the time point to a predicted time point. Item 47: The method of any one of items 43-46, further comprising the step of obtaining a reference pressure signal from a reference sensor (4a-4c) in the extracorporeal fluid system (S1), wherein the reference sensor (4a-4c) is arranged to detect said second pulses even if the fluid connection (C) is compromised, and calculating the predicted temporal signal profile based on the reference pressure signal. Item 48: The method of item 47, further comprising the steps of calculating a magnitude value indicative of the magnitude of the physiological pulses in the reference pressure signal, and comparing the magnitude value to a limit, wherein the step of calculating the predicted temporal signal profile based on the reference pressure signal is conditioned upon said step of comparing. Item 49: The method of item 47 or 48, wherein the step of calculating the predicted temporal signal profile comprises adjusting for a difference in transit time between the reference sensor and said at least one pressure sensor (4a-4c). Item 50: The method of item 49, wherein said difference in transit time is given by a predefined value. Item 51: The method of item 49, wherein said difference in transit time is calculated based on a difference in fluid pressure between the location of the reference sensor and said at least one pressure sensor (4a-4c). Item 52: The method of any one of items 40-51, wherein the time window is selected so as to contain at least one second pulse. Item 53: The method of item 52, wherein the length of the time window is chosen to exceed a maximum pulse repetition interval of said physiological phenomenon. Item 54: The method of item 52 or 53, wherein the time window is chosen based on timing information indicative of the timing of the second pulses in the monitoring signal. Item 55: The method of any one of items 40-54, wherein a step of generating the monitoring signal comprises: filtering the measurement signal to remove the first pulses; deriving, based on timing information indicative of the timing of the second pulses in the measurement signal, a set of signal segments in the thus-filtered measurement signal(s); and aligning and adding the signal segments, based on the timing information. Item 56: The method of any one of items 40-55, wherein said calculating comprises: identifying a candidate second pulse in the monitoring signal and a corresponding candidate time point; and validating the candidate second pulse based on the candidate time point in relation to timing information indicative of the timing of the second pulses in the monitoring signal. Item 57: The method of any one of items 54-56, wherein the timing information is obtained from a pulse sensor coupled to the subject. Item 58: The method of any one of items 54-56, wherein the timing information is obtained as a function of the relative timing of second pulses identified based on preceding parameter values. Item 59: The method of any one of items 54-56, wherein the extracorporeal fluid system (S1) is an extracorporeal blood flow circuit (20) comprising an arterial access device (1), a blood processing device (6), and a venous access device (14), wherein vascular system (S2) comprises a blood vessel access, wherein the arterial access device (1) is connected to the vascular system (S2), wherein the venous access device (14) is connected to the blood vessel access to form the fluid connection (C), wherein the mechanical pulse generator (3) comprises a pumping device arranged in the extracorporeal blood flow circuit (20) to pump blood from the arterial access device (1) through the blood processing device (6) to the venous access device (14), wherein the monitoring signal is generated based on a venous measurement signal obtained from a venous pressure sensor (4c) located downstream of the pumping device (3), said method comprising: obtaining an arterial measurement signal from an arterial pressure sensor (4a) located upstream of the pumping device (3), identifying at least one second pulse in the arterial measurement signal; and calculating the timing information from the thus-identified second pulse(s). Item 60: The method of any one of items 54-56, further comprising: intermittently turning off the mechanical pulse generator (3); identifying at least one second pulse in the monitoring signal; and calculating the timing information from the thus-identified second pulse. Item 61: The method of any one of items 54-56, further comprising: identifying a set of candidate second pulses in the monitoring signal; deriving a sequence of candidate time points based on the set of candidate second pulses; validating the sequence of candidate time points against a temporal criterion; and calculating the timing information as a function of the thus-validated sequence of candidate time points. 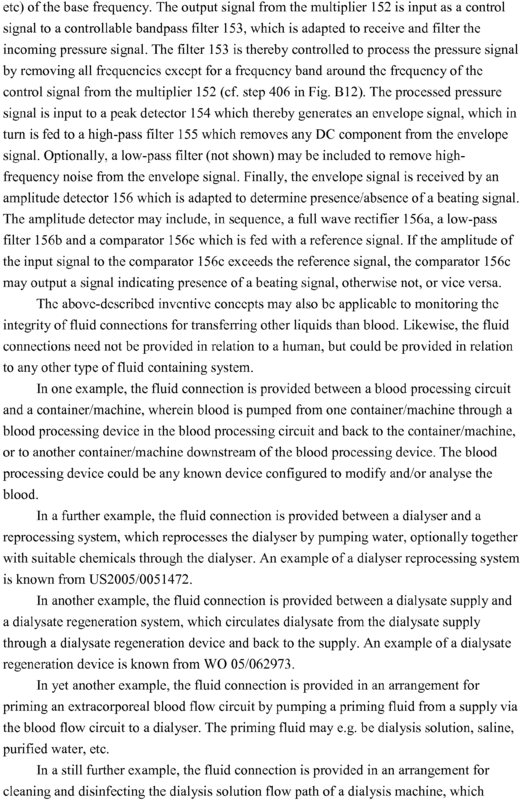 Item 62: The method of item 39, wherein the extracorporeal fluid system (S1) is an extracorporeal blood processing system (20) comprising an access device (1, 14), wherein the vascular system (S2) comprises a blood vessel access, and wherein a connection between the access device (1, 14) and the blood vessel access forms the fluid connection (C). 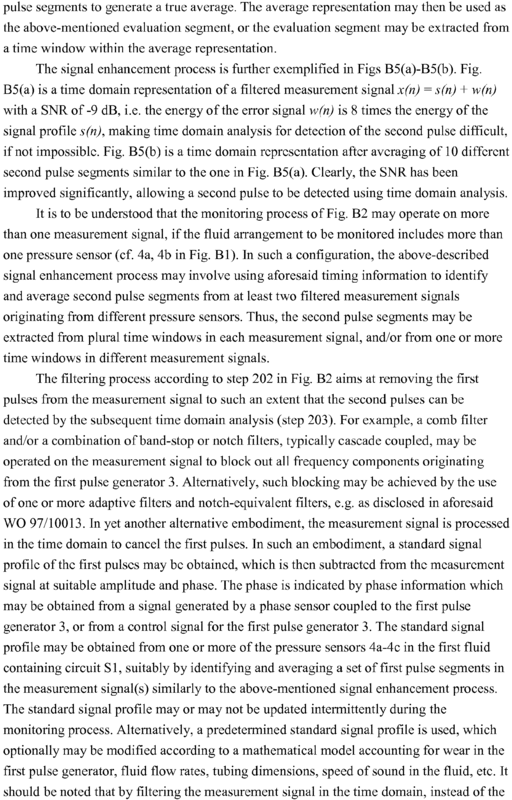 Item 63: The method of item 39, wherein said pressure data is a time-dependent monitoring signal including second pulses originating from said physiological phenomenon, said method further comprising: obtaining timing information indicative of the timing of the second pulses in the monitoring signal; processing the monitoring signal based on the timing information, to calculate a parameter value indicative of presence or absence of the second pulses; and determining the integrity of the fluid connection (C) based at least partly on the parameter value. Item 64: The method of item 63, wherein said processing comprises: locating a time window in the monitoring signal, based on the timing information; and calculating the parameter value based on the signal values within said time window. Item 65: The method of item 64, wherein said processing further comprises: selecting the length of the time window based on the timing information. Item 66: The method of any one of items 63-65, wherein the extracorporeal fluid system (S1) is associated with a mechanical pulse generator (3) that generates first pulses in the extracorporeal fluid system (S1), and wherein a step of generating the monitoring signal comprises: filtering the measurement signal to remove the first pulses. Item 67: The method of item 66, wherein the step of generating the monitoring signal further comprises: selecting a set of signal segments in the thus-filtered measurement signal; and aligning and adding the signal segments, based on the timing information. 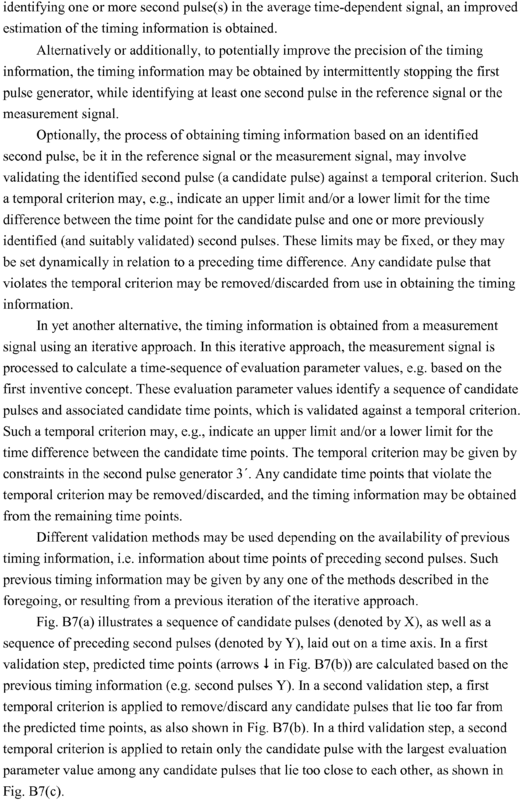 Item 68: The method of item 66 or 67, wherein said calculating comprises: identifying a candidate second pulse in the monitoring signal and a corresponding candidate time point; and validating the candidate second pulse based on the candidate time point in relation to the timing information. Item 69: The method of any one of items 63-68, wherein the timing information is obtained from a pulse sensor coupled to the subject. 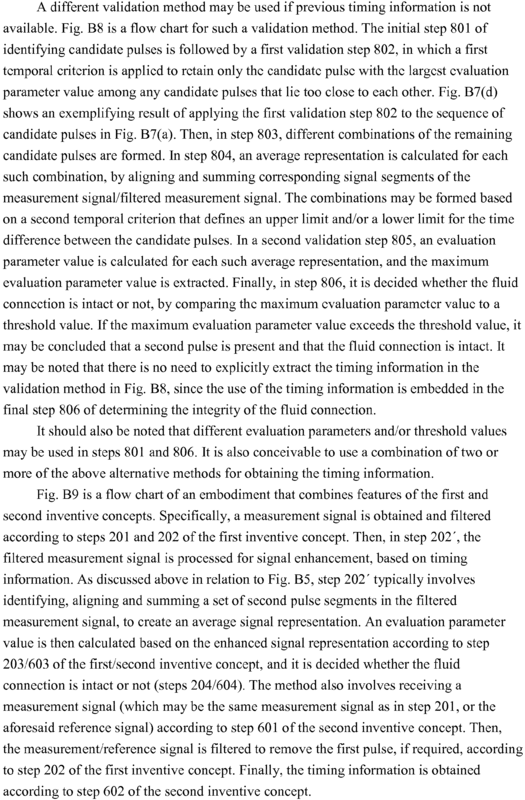 Item 70: The method of any one of items 63-68, wherein the timing information is obtained as a function of the relative timing of second pulses identified based on preceding parameter values. 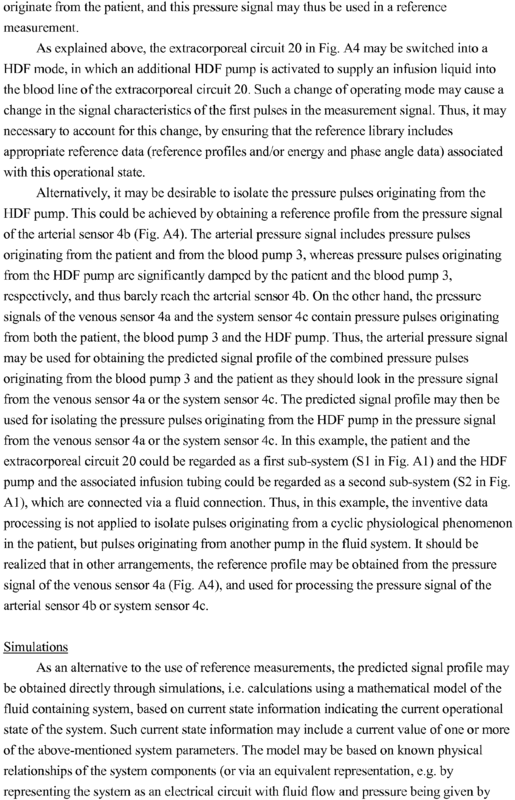 Item 71: The method of any one of items 63-68, further comprising the step of obtaining a reference pressure signal from a reference sensor (4a-4c) in the extracorporeal fluid system (S1), wherein the reference sensor (4a-4c) is arranged to detect said second pulses even if the fluid connection (C) is compromised, and wherein said step of obtaining the timing information comprises: identifying at least one second pulse in the reference pressure signal and obtaining an estimated difference in arrival time between the reference sensor and said at least one pressure sensor (4a-4c). Item 72: The method of item 71, wherein the estimated difference in arrival time is given by a predefined value. Item 73: The method of item 71, wherein the estimated difference in arrival time is calculated based on a difference in fluid pressure between the location of the reference sensor and said at least one pressure sensor (4a-4c). Item 74: The method of item 71, further comprising the steps of calculating a magnitude value indicative of the magnitude of said at least one second pulse in the reference pressure signal, and comparing the magnitude value to a limit, wherein the step of calculating an estimated difference in arrival time is conditioned upon said step of comparing. 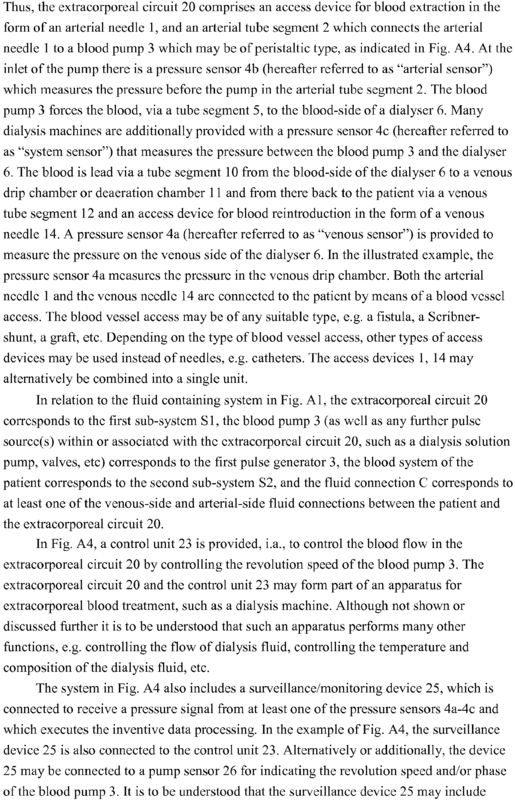 Item 75: The method of any one of items 66-68, wherein the extracorporeal fluid system (S1) is an extracorporeal blood flow circuit comprising an arterial access device (1), a blood processing device (6), and a venous access device (14), wherein the vascular system (S2) comprises a blood vessel access, wherein the arterial access device (1) is connected to the vascular system (S2), wherein the venous access device (14) is connected to the blood vessel access to form the fluid connection (C), wherein the mechanical pulse generator (3) comprises a pumping device arranged in the extracorporeal blood flow circuit (20) to pump blood from the arterial access device (1) through the blood processing device (6) to the venous access device (14), wherein the monitoring signal is generated based on a venous measurement signal obtained from a venous pressure sensor (4c) located downstream of the pumping device (3), said method comprising: obtaining an arterial measurement signal from an arterial pressure sensor (4a) located upstream of the pumping device (3), identifying at least one second pulse in the arterial measurement signal; and calculating the timing information from the thus-identified second pulse(s). Item 76: The method of any one of items 66-68, further comprising: intermittently turning off the mechanical pulse generator (3); identifying at least one second pulse in the monitoring signal; and calculating the timing information from the thus-identified second pulse. Item 77: The method of any one of items 66-68, further comprising: identifying a set of candidate second pulses in the monitoring signal; deriving a sequence of candidate time points based on the set of candidate second pulses; validating the sequence of candidate time points against a temporal criterion; and calculating the timing information as a function of the thus-validated sequence of candidate time points. 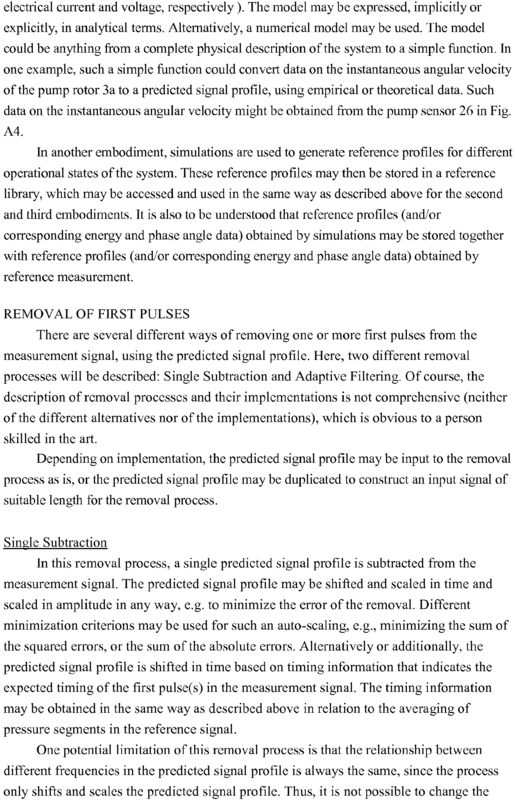 Item 78: The method of item 63, wherein said obtaining further comprises: identifying a set of candidate second pulses in the monitoring signal; deriving a sequence of candidate time points based on the set of candidate second pulses; generating a set of validated candidate second pulses by validating the sequence of candidate time points against a temporal criterion; wherein said processing comprises: calculating a set of average representations, each average representation being formed by aligning and adding signal segments of the monitoring signal that correspond to a unique combination of validated candidate second pulses; and calculating the parameter value for each of said average representations; and wherein said determining comprises comparing a maximum parameter value to a threshold value. Item 79: The method of any one of items 63-66, wherein the parameter value represents a distribution of signal values. Item 80: The method of any one of items 39-79, further comprising the step of processing the measurement signal for identification of heart data originating from heart beats of said subject, and wherein the integrity of the fluid connection is determined based on said pressure data and said heart data. Item 100: A computer program product comprising instructions for causing a computer to perform the method of any one of items 1-80. Item 200: A device for processing a measurement signal obtained by a pressure sensor (4a-4c) in an extracorporeal fluid system (S1) connected to a vascular system (S2) of a subject, said device comprising: an input (28) for receiving the measurement signal; and a signal processor (25) connected to said input (28) and configured to process the measurement signal according to any one of items 1-80. Item 300: A device for processing a measurement signal obtained by a pressure sensor (4a-4c) in an extracorporeal fluid system (S1) connected to a vascular system (S2) of a subject, said device comprising: means (28) for receiving the measurement signal; and means (29) for processing the measurement signal for identification of pressure data originating from a first physiological phenomenon in said subject, said physiological phenomenon excluding the heart of said subject. Item 301: The device of item 300, wherein said physiological phenomenon is included in the group consisting of reflexes, voluntary muscle contractions, non-voluntary muscle contractions, a breathing system of said subject, an autonomous system of said subject for blood pressure regulation and an autonomous system of said subject for body temperature regulation. Item 302: The device of item 300, wherein said physiological phenomenon is a repetitive physiological pulse generator. 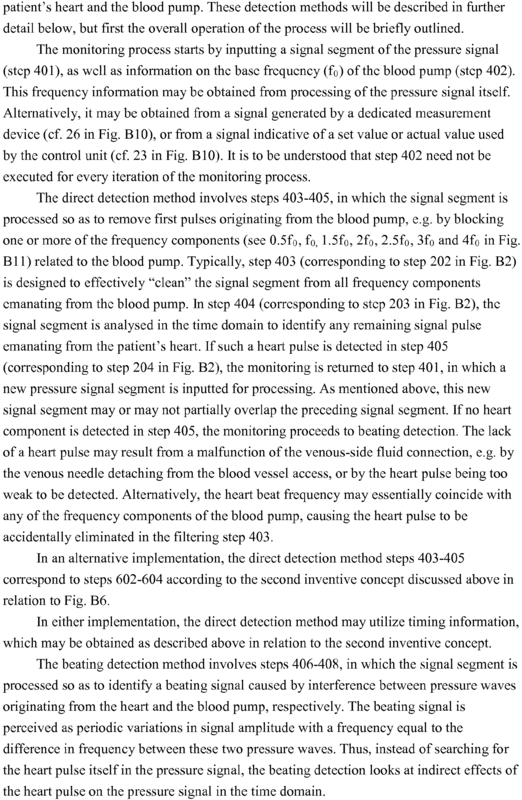 Item 303: The device of any of items 300-302, wherein the means (29) for processing is configured to filter the measurement signal in the frequency domain. 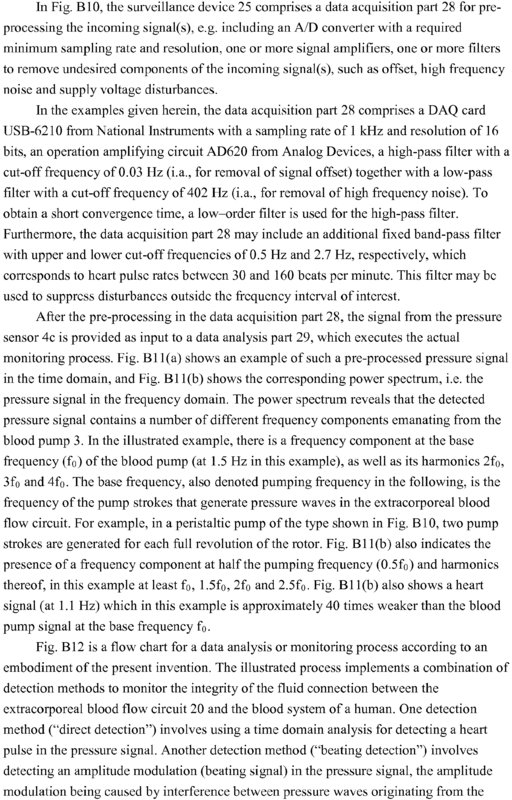 Item 304: The device of any of items 300-303, wherein the means (29) for processing is configured to filter the measurement signal to remove frequencies above about 0.5 Hz. Alternatively or additionally, the means (29) for processing may be configured to filter the measurement signal to remove frequencies below about 3.5 Hz. Item 305: The device of item 304, wherein the means (29) for filtering is configured filter the measurement signal with respect to at least one frequency range included in the group consisting of about 0.15 Hz to about 0.4 Hz, about 0.04 Hz to about 0.15Hz, and about 0.001Hz to about 0.1 Hz. 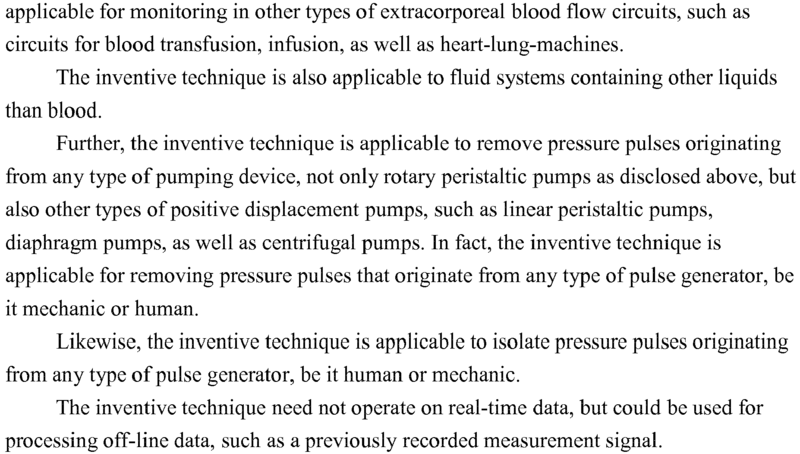 Item 306: The device of any of items 300-305, wherein the extracorporeal fluid system (S1) is associated with a mechanical pulse generator (3), wherein the pressure sensor (4a-4c) is arranged in the extracorporeal fluid system (S1) to detect a first pulse originating from the mechanical pulse generator (3) and a second pulse originating from said physiological phenomenon. Item 307: The device of item 306, further comprising means (23, 28, 29) for controlling the mechanical pulse generator (3) so as to separate the first and second pulses in the time and/or frequency domain. Item 308: The device of item 306, further comprising means (23, 28, 29) for intermittently turning off the mechanical pulse generator (3) while obtaining the measurement signal. 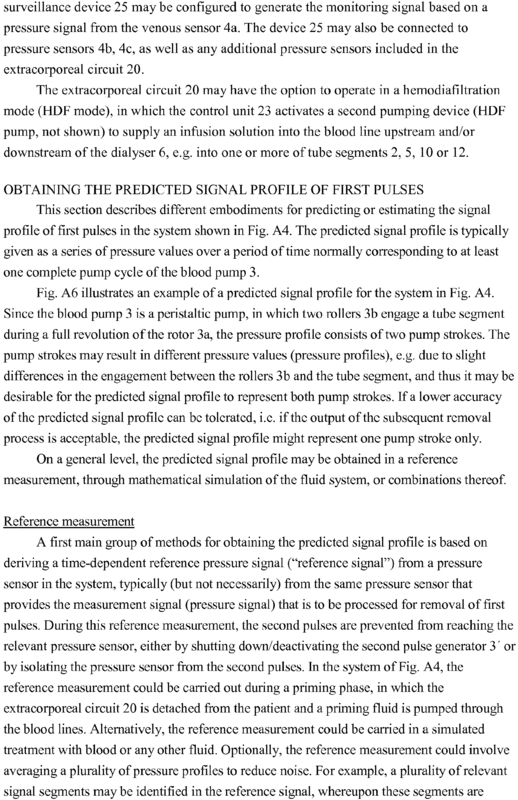 Item 309: The device of item 306, further comprising means (29) for obtaining a first pulse profile (u(n)) which is a predicted temporal signal profile of the first pulse, and means (29) for filtering the measurement signal in the time-domain, using the first pulse profile (u(n)), to essentially eliminate the first pulse while retaining the second pulse. Item 310: The device of item 309, wherein the means (29) of filtering is configured to subtract the first pulse profile (u(n)) from the measurement signal. Item 311: The device of item 310, wherein the means (29) for filtering is configured to subtract the first pulse profile (u(n)) by adjusting a phase of the first pulse profile (u(n)) in relation to the measurement signal, wherein said phase is indicated by phase information obtained from a phase sensor (26) coupled to the mechanical pulse generator (3), or from a control unit (23) for the mechanical pulse generator (3). The means (29) for filtering may also be configured to adjust an amplitude of the first pulse profile in relation to the measurement signal. Item 312: The device of any one of items 309-311, further comprising reference measurement means (29) for obtaining the first pulse profile (u(n)) in a reference measurement in said extracorporeal fluid system (S1), wherein the reference measurement means (29) is configured to, while the mechanical pulse generator (3) is operated to generate at least one first pulse, obtain the first pulse profile (u(n)) from a reference signal generated by a reference pressure sensor (4a-4c) in the extracorporeal fluid system (S1). Item 313: The device of item 312, wherein the mechanical pulse generator (3) is operated to generate a sequence of first pulses during the reference measurement, and wherein reference measurement means (29) is configured to obtain the first pulse profile (u(n)) by identifying and averaging a set of first pulse segments in the reference signal. Item 314: The device of item 312 or 313, wherein reference measurement means (29) is configured to intermittently effect the reference measurement during operation of the extracorporeal fluid system (S1) to provide an updated first pulse profile (u(n)). Item 315: The device of any one of items 312-314, wherein the pressure sensor (4a-4c) is used as said reference pressure sensor. 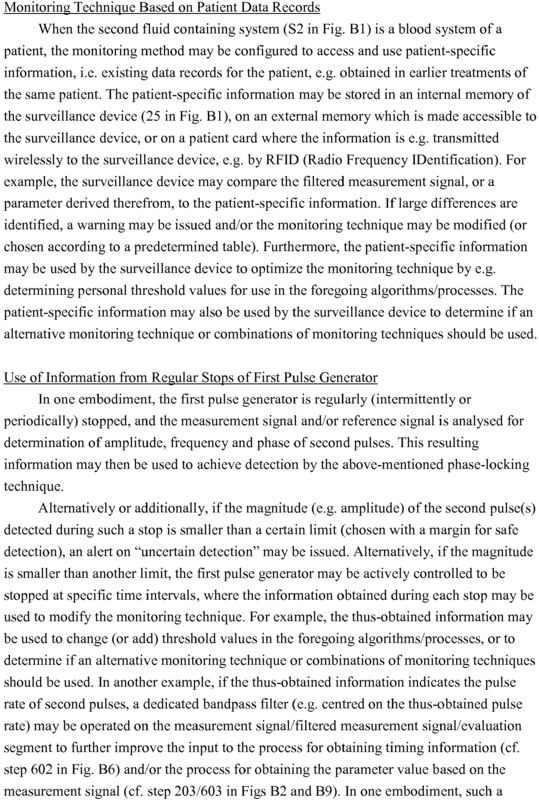 Item 316: The device of any one of items 309-311, wherein the means (29) for obtaining a first pulse profile is configured to obtain a predetermined signal profile. 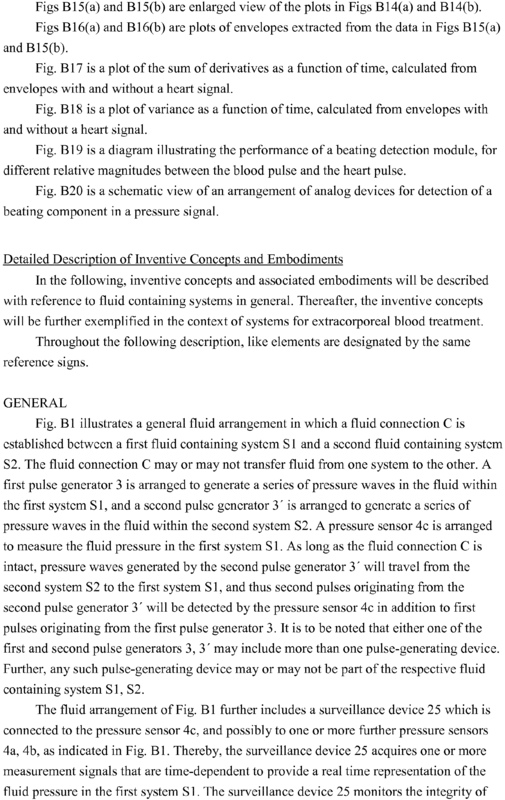 Item 317: The device of item 316, wherein the means (29) for obtaining a first pulse profile is further configured to modify the predetermined signal profile according to a mathematical model based on a current value of one or more system parameters of the extracorporeal fluid system (S1). Item 318: The device of any one of items 312-315, wherein the extracorporeal fluid system (S1) is operated, during the reference measurement, such that the reference signal contains a first pulse and no second pulse. Item 319: The device of any one of items 312-315, wherein the reference measurement means (29) is configured to: obtain a combined pulse profile based on a first reference signal containing a first pulse and a second pulse; obtain a second pulse profile based on a second reference signal containing a second pulse and no first pulse; and obtain the predicted signal profile by subtracting the second pulse profile from the combined pulse profile. Item 320: The device of item 319, further comprising means (28, 29) for obtaining a current value of one or more system parameters of the extracorporeal fluid system (S1), wherein the means (29) for obtaining a first pulse profile is configured to obtain the first pulse profile (u(n)) as a function of the current value. Item 321: The device of item 320, wherein the means (29) for obtaining a first pulse profile (u(n)) is configured to: identify, based on the current value, one or more reference profiles (r1(n), r2(n)) in a reference database; and obtain the first pulse profile (u(n)) based on said one or more reference profiles (r1(n), r2(n)). Item 322: The device of item 321, wherein said one or more system parameters is indicative of the rate of first pulses in the extracorporeal fluid system (S1). Item 323: The device of item 322, wherein the mechanical pulse generator (3) comprises a pumping device and the system parameter is indicative of a pump frequency of the pumping device. Item 324: The device of any one of items 321-323, wherein each reference profile (r1(n), r2(n)) in the reference database is obtained by a reference measurement in the extracorporeal fluid system (S1) for a respective value of said one or more system parameters. Item 325: The device of item 320, wherein the means (29) for obtaining a first pulse profile (u(n)) is configured to: identify, based on the current value, one or more combinations of energy and phase angle data in a reference database; and obtain the first pulse profile (u(n)) based on said one or more combinations of energy and phase angle data. Item 326: The device of item 325, wherein the means (29) for obtaining a first pulse profile (u(n)) is configured to obtain the first pulse profile (u(n)) by combining a set of sinusoids of different frequencies, wherein the amplitude and phase angle of each sinusoid is given by said one or more combinations of energy and phase angle data. 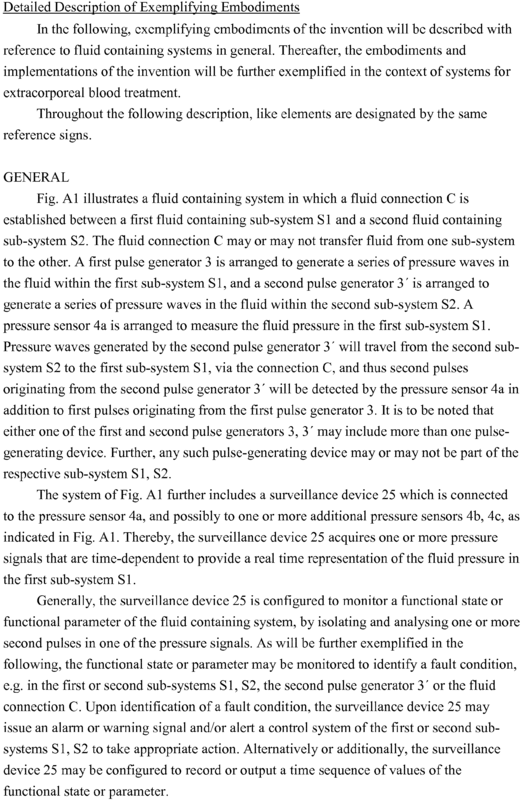 Item 327: The device of item 320, wherein the means (29) for obtaining a first pulse profile (u(n)) is configured to: input the current value into an algorithm which calculates the response of the pressure sensor (4a-4c) based on a mathematical model of the extracorporeal fluid system (S1). Item 328: The device of any one of items 309-327, wherein the means (29) for filtering is configured to adjust at least one of the amplitude, the time scale and the phase of the first pulse profile (u(n)) with respect to the measurement signal and to subtract the thus-adjusted first pulse profile (u(n)) from the measurement signal. Item 329: The device of item 328, wherein the means (29) for filtering is configured to adjust by minimizing a difference between the first pulse profile (u(n)) and the measurement signal. Item 330: The device of items 309-327, wherein the means (29) for filtering is configured to: supply the first pulse profile (u(n)) as input to an adaptive filter (30); calculate an error signal (e(n)) between the measurement signal and an output signal (d̂(n)) of the adaptive filter (30); and provide the error signal (e(n)) as input to the adaptive filter (30), whereby the adaptive filter (30) is arranged to essentially eliminate the first pulse in the error signal (e(n)). Further, the adaptive filter (30) may be configured to generate the output signal as a linear combination of M shifted first pulse profiles, and specifically the adaptive filter (30) may be configured to linearly combine M instances of the first pulse profile, which are properly adjusted in amplitude and phase by the adaptive filter (30). Item 331: The device of item 330, wherein the adaptive filter (30) comprises a finite impulse response filter (32) with filter coefficients that operate on the first pulse profile (u(n)) to generate the output signal (d̂(n)), and an adaptive algorithm (34) which optimizes the filter coefficients as a function of the error signal (e(n)) and the first pulse profile (u(n)). 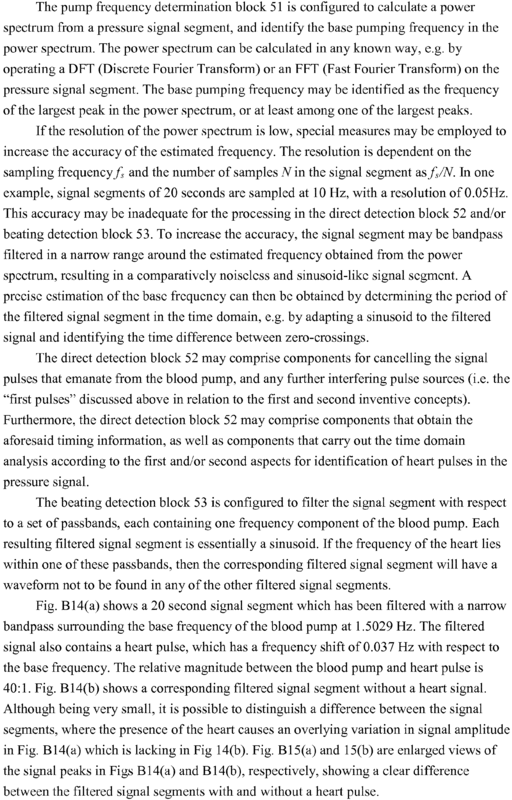 Item 332: The device of item 330 or 331, further comprising means (29) for controlling the adaptive filter (30) to lock the filter coefficients, based on a comparison of the rate and/or amplitude of the second pulses to a limit value. Item 333: The device of any of items 300-305, wherein said pressure data is a time-dependent monitoring signal including second pulses originating from said physiological phenomenon, said device further comprising: means (28) for obtaining a reference pressure signal from a reference sensor in the extracorporeal fluid system (S1); means (29) for identifying at least one second pulse in the reference pressure signal; means (29) for calculating an estimated difference in arrival time between the reference sensor and said at least one pressure sensor (4a-4c) based on a difference in fluid pressure between the location of the reference sensor and said at least one pressure sensor (4a-4c); and means (29) for processing the monitoring signal based on the estimated difference in arrival time. Item 334: The device of item 333, further comprising means (29) for calculating a magnitude value indicative of the magnitude of said at least one second pulse in the reference pressure signal, and comparing the magnitude value to a limit, wherein the calculating an estimated difference in arrival time is conditioned upon the comparing. Item 335: The device of any of items 300-334, wherein the means (29) for processing is configured to perform one or more of detecting, tracking and predicting a disordered condition of the subject using said pressure data. Item 336: The device of item 335, wherein the disordered condition comprises one or more of sneezing, hiccups, vomiting, coughing, blood pressure turbulence, ectopic beats, lack of autonomous regulation, hypotension, disordered breathing, sleep apnea, periodic breathing, hyperventilation, asthmatic attacks, dyspnea, and Cheyne-Stokes respiration. Item 337: The device of item 335 or 336, wherein said pressure data is a time-dependent monitoring signal including second pulses originating from said physiological phenomenon, said device further comprising: means (29) for obtaining timing information indicative of the timing of the second pulses in the monitoring signal; means (29) for processing the monitoring signal based on the timing information, to calculate a parameter value indicative of the second pulses; and means (29) for analysing the parameter value for detection of the disordered condition. 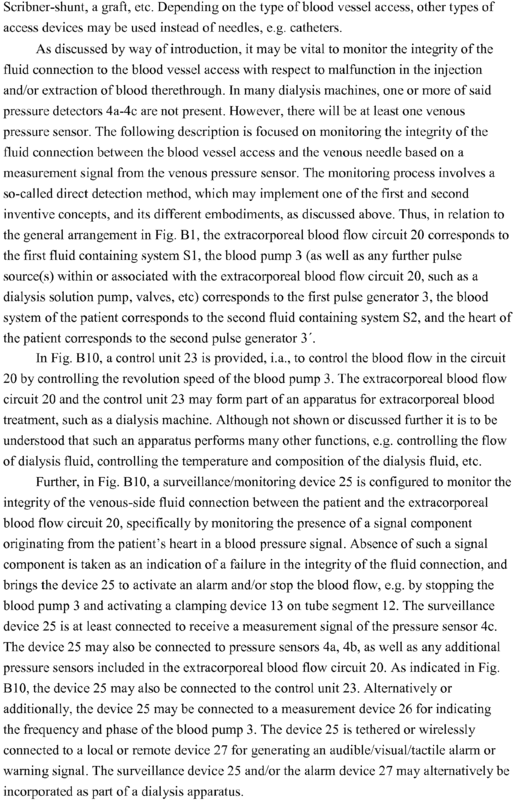 Item 338: The device of any one of items 300-305, further comprising means (29) for monitoring the integrity of a fluid connection between said extracorporeal fluid system (S1) and said vascular system (S2) based on said pressure data. Item 339: The device of item 338, wherein the extracorporeal fluid system (S1) is associated with a mechanical pulse generator (3), wherein the pressure sensor (4a-4c) is arranged in the extracorporeal fluid system (S1) to detect a first pulse originating from the mechanical pulse generator (3) and a second pulse originating from said first physiological phenomenon, and wherein said pressure data is a time-dependent monitoring signal including second pulses originating from said physiological phenomenon, said device further comprising means (29) for calculating a parameter value based on signal values within a time window in the monitoring signal, the parameter value representing a distribution of the signal values; and means (29) for determining the integrity of the fluid connection (C) based at least partly on the parameter value. Item 340: The device of item 339, wherein the means (29) for calculating a parameter value is configured to: calculate the parameter value as a statistical dispersion measure of the signal values within the time window. Item 341: The device of item 340, wherein the statistical dispersion measure includes at least one of: a standard deviation, a variance, a coefficient of variation, a sum of differences, an energy, a power, a sum of absolute deviations from an average value, and an average of absolute differences from an average value. 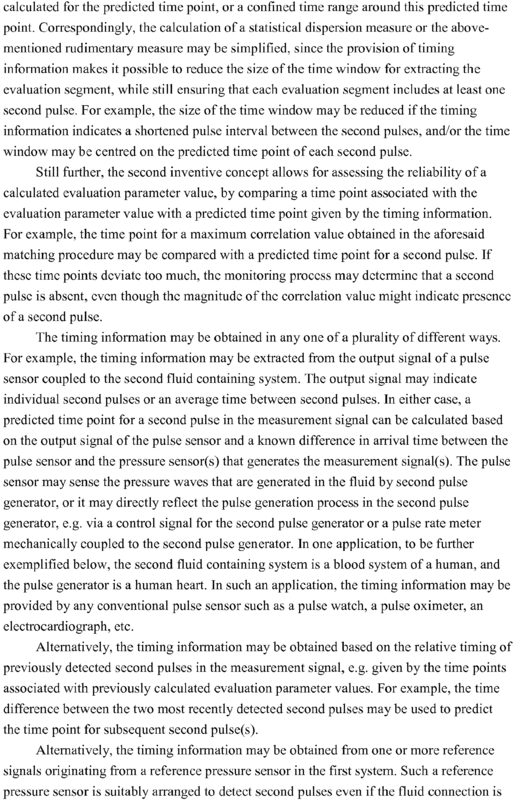 Item 342: The device of item 339, wherein the means (29) for calculating a parameter value is configured to: match the signal values within the time window to a predicted temporal signal profile of a second pulse. Item 343: The device of item 342, wherein the parameter value is a correlation value resulting from said matching. Item 344: The device of item 342 or 343, wherein the means (29) for calculating a parameter value is configured to: calculate a cross-correlation between the signal values within the time window and the predicted temporal signal profile; and identify a maximum correlation value in the cross-correlation; wherein the means (29) for determining the integrity is configured to: compare the maximum correlation value to a threshold value. Item 345: The device of item 344, wherein the means (29) for calculating a parameter value is configured to: obtain a time point of the maximum correlation value, and validate the maximum correlation value by comparing the time point to a predicted time point. Item 346: The device of any one of items 342-345, further comprising means (29) for obtaining a reference pressure signal from a reference sensor (4a-4c) in the extracorporeal fluid system (S1), and means (29) for calculating the predicted temporal signal profile based on the reference pressure signal, wherein the reference sensor (4a-4c) is arranged to detect said second pulses even if the fluid connection (C) is compromised. Item 347: The device of item 346, further comprising means (29) for calculating a magnitude value indicative of the magnitude of the physiological pulses in the reference pressure signal, and comparing the magnitude value to a limit, wherein the operation of the means (29) for calculating the predicted temporal signal profile based on the reference pressure signal is conditioned upon said comparing. Item 348: The device of item 346 or 347, wherein the means (29) for calculating the predicted temporal signal profile is configured to adjust for a difference in transit time between the reference sensor and said at least one pressure sensor (4a-4c). Item 349: The device of item 348, wherein said difference in transit time is given by a predefined value. Item 350: The device of item 348, wherein said difference in transit time is calculated based on a difference in fluid pressure between the location of the reference sensor and said at least one pressure sensor (4a-4c). Item 351: The device of any one of items 339-350, wherein the time window is selected so as to contain at least one second pulse. Item 352: The device of item 351, wherein the length of the time window is chosen to exceed a maximum pulse repetition interval of said first physiological phenomenon. Item 353: The device of item 351 or 352, wherein the time window is chosen based on timing information indicative of the timing of the second pulses in the monitoring signal. Item 354: The device of any one of items 339-353, further comprising means (29) for generating the monitoring signal which is configured to generate the monitoring signal by: filtering the measurement signal to remove the first pulses; deriving, based on timing information indicative of the timing of the second pulses in the measurement signal, a set of signal segments in the thus-filtered measurement signal(s); and aligning and adding the signal segments, based on the timing information. Item 355: The device of any one of items 339-354, wherein the means (29) for calculating a parameter value is configured to: identify a candidate second pulse in the monitoring signal and a corresponding candidate time point; and validate the candidate second pulse based on the candidate time point in relation to timing information indicative of the timing of the second pulses in the monitoring signal. Item 356: The device of any one of items 353-355, further comprising means (28, 29) for obtaining the timing information from a pulse sensor coupled to the subject. 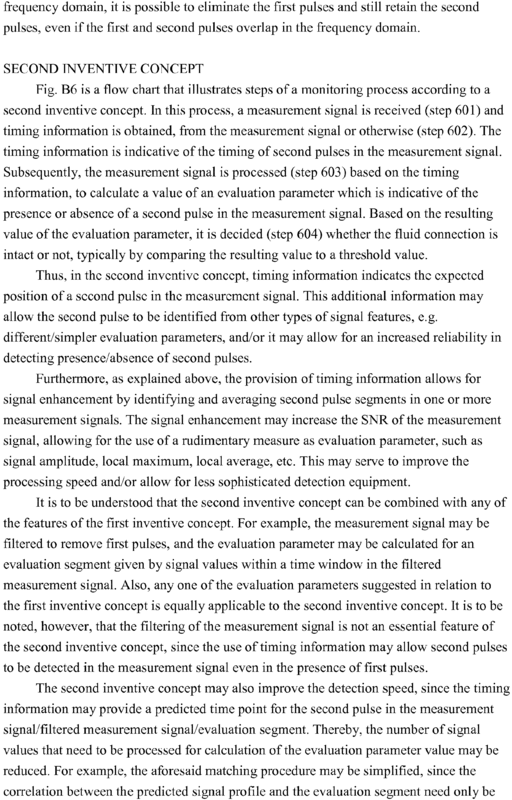 Item 357: The device of any one of items 353-355, further comprising means (29) for obtaining the timing information as a function of the relative timing of second pulses identified based on preceding parameter values. Item 358: The device of any one of items 353-355, wherein the extracorporeal fluid system (S1) is an extracorporeal blood flow circuit (20) comprising an arterial access device (1), a blood processing device (6), and a venous access device (14), wherein vascular system (S2) comprises a blood vessel access, wherein the arterial access device (1) is connected to the vascular system (S2), wherein the venous access device (14) is connected to the blood vessel access to form the fluid connection (C), wherein the mechanical pulse generator (3) comprises a pumping device arranged in the extracorporeal blood flow circuit (20) to pump blood from the arterial access device (1) through the blood processing device (6) to the venous access device (14), wherein the monitoring signal is generated based on a venous measurement signal obtained from a venous pressure sensor (4c) located downstream of the pumping device (3). The device may further comprise means (28) for obtaining an arterial measurement signal from an arterial pressure sensor (4a) located upstream of the pumping device (3); means (29) for identifying at least one second pulse in the arterial measurement signal; and means (29) for calculating the timing information from the thus-identified second pulse(s). Item 359: The device of any one of items 353-355, further comprising: means (23, 28, 29) for intermittently turning off the mechanical pulse generator (3); means (29) for identifying at least one second pulse in the monitoring signal; and means (29) for calculating the timing information from the thus-identified second pulse. Item 360: The device of any one of items 353-355, further comprising: means (29) for identifying a set of candidate second pulses in the monitoring signal; means (29) for deriving a sequence of candidate time points based on the set of candidate second pulses; means (29) for validating the sequence of candidate time points against a temporal criterion; and means (29) for calculating the timing information as a function of the thus-validated sequence of candidate time points. Item 361: The device of item 338, wherein the extracorporeal fluid system (S1) is an extracorporeal blood processing system (20) comprising an access device (1, 14), wherein the vascular system (S2) comprises a blood vessel access, and wherein a connection between the access device (1, 14) and the blood vessel access forms the fluid connection (C). 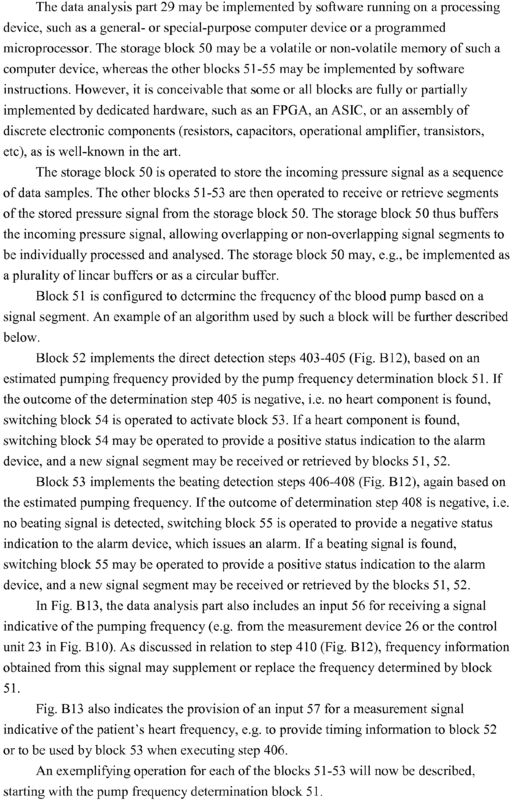 Item 362: The device of item 338, wherein said pressure data is a time-dependent monitoring signal including second pulses originating from said physiological phenomenon, said device further comprising: means (29) for obtaining timing information indicative of the timing of the second pulses in the monitoring signal; means (29) for processing the monitoring signal based on the timing information, to calculate a parameter value indicative of presence or absence of the second pulses; and means (29) for determining the integrity of the fluid connection (C) based at least partly on the parameter value. Item 363: The device of item 362, wherein the means (29) for processing the monitoring signal is configured to: locate a time window in the monitoring signal, based on the timing information; and calculate the parameter value based on the signal values within said time window. Item 364: The device of item 363, wherein the means (29) for processing the monitoring signal is further configured to: select the length of the time window based on the timing information. Item 365: The device of any one of items 362-364, wherein the extracorporeal fluid system (S1) is associated with a mechanical pulse generator (3) that generates first pulses in the extracorporeal fluid system (S1), and wherein the device further comprises means (29) for generating the monitoring signal by filtering the measurement signal to remove the first pulses. Item 366: The device of item 365, wherein the means (29) for generating the monitoring signal is further configured to: select a set of signal segments in the thus-filtered measurement signal; and align and add the signal segments, based on the timing information. Item 367: The device of item 365 or 366, wherein the means (29) for processing the monitoring signal is configured to: identify a candidate second pulse in the monitoring signal and a corresponding candidate time point; and validate the candidate second pulse based on the candidate time point in relation to the timing information. Item 368: The device of any one of items 362-367, wherein the means (28, 29) for obtaining timing information is configured to obtain the timing information from a pulse sensor coupled to the subject. 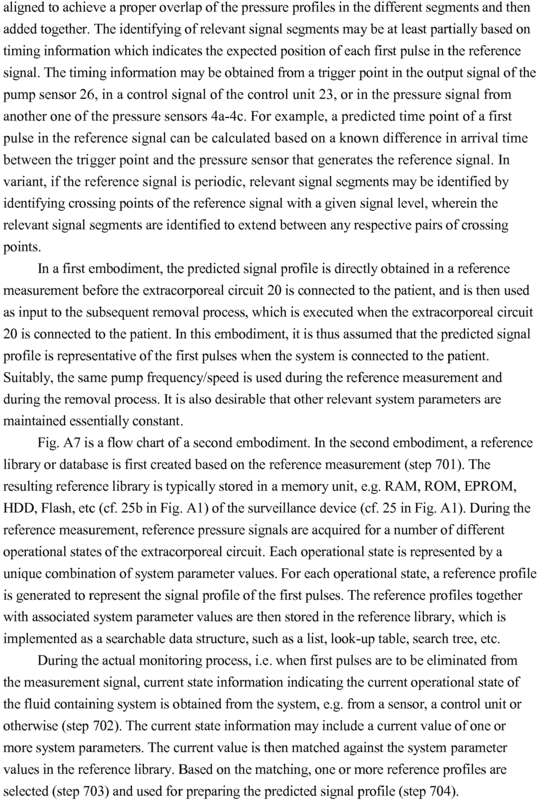 Item 369: The device of any one of items 362-367, wherein the means (29) for obtaining timing information is configured to obtain the timing information as a function of the relative timing of second pulses identified based on preceding parameter values. 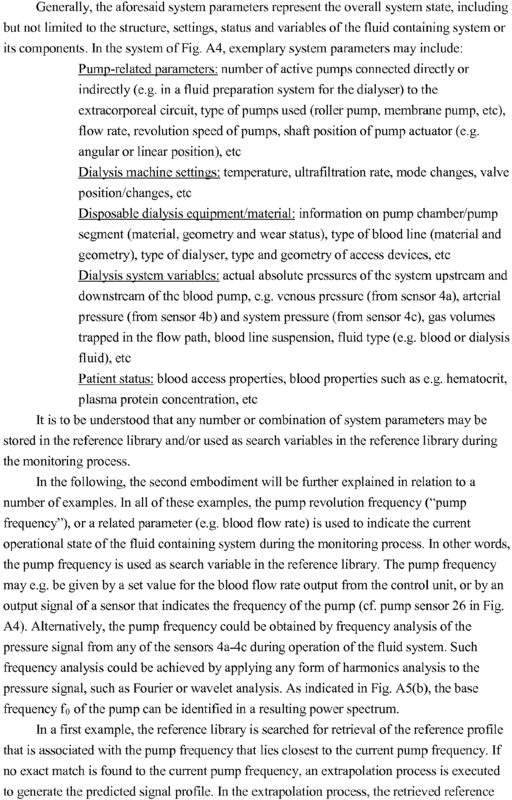 Item 370: The device of any one of items 362-367, further comprising means (28) for obtaining a reference pressure signal from a reference sensor (4a-4c) in the extracorporeal fluid system (S1), wherein the reference sensor (4a-4c) is arranged to detect said second pulses even if the fluid connection (C) is compromised, and wherein the means (29) for obtaining timing information is configured to: identify at least one second pulse in the reference pressure signal and obtain an estimated difference in arrival time between the reference sensor and said at least one pressure sensor (4a-4c). Item 371: The device of item 370, wherein the estimated difference in arrival time is given by a predefined value. Item 372: The device of item 370, wherein the estimated difference in arrival time is calculated based on a difference in fluid pressure between the location of the reference sensor and said at least one pressure sensor (4a-4c). 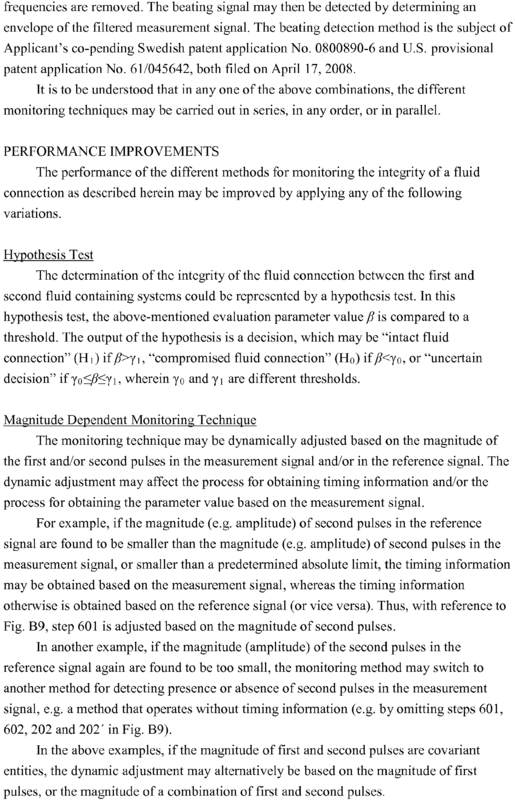 Item 373: The device of item 370, further comprising means (29) for calculating a magnitude value indicative of the magnitude of said at least one second pulse in the reference pressure signal, and comparing the magnitude value to a limit, wherein the calculating of an estimated difference in arrival time is conditioned upon said comparing. Item 374: The device of any one of items 365-367, wherein the extracorporeal fluid system (S1) is an extracorporeal blood flow circuit comprising an arterial access device (1), a blood processing device (6), and a venous access device (14), wherein the vascular system (S2) comprises a blood vessel access, wherein the arterial access device (1) is connected to the vascular system (S2), wherein the venous access device (14) is connected to the blood vessel access to form the fluid connection (C), wherein the mechanical pulse generator (3) comprises a pumping device arranged in the extracorporeal blood flow circuit (20) to pump blood from the arterial access device (1) through the blood processing device (6) to the venous access device (14), wherein the monitoring signal is generated based on a venous measurement signal obtained from a venous pressure sensor (4c) located downstream of the pumping device (3), said device comprising: means (28) for obtaining an arterial measurement signal from an arterial pressure sensor (4a) located upstream of the pumping device (3); means (29) for identifying at least one second pulse in the arterial measurement signal; and means (29) for calculating the timing information from the thus-identified second pulse(s). Item 375: The device of any one of items 365-367, further comprising means (23, 28, 29) for intermittently turning off the mechanical pulse generator (3); means (29) for identifying at least one second pulse in the monitoring signal; and means (29) for calculating the timing information from the thus-identified second pulse. Item 376: The device of any one of items 365-367, further comprising means (29) for identifying a set of candidate second pulses in the monitoring signal; means (29) for deriving a sequence of candidate time points based on the set of candidate second pulses; means (29) for validating the sequence of candidate time points against a temporal criterion; and means (29) for calculating the timing information as a function of the thus-validated sequence of candidate time points. Item 377: The device of item 362, wherein the means (29) for obtaining timing information is configured to: identify a set of candidate second pulses in the monitoring signal; derive a sequence of candidate time points based on the set of candidate second pulses; generate a set of validated candidate second pulses by validating the sequence of candidate time points against a temporal criterion; wherein the means (29) for processing the monitoring signal is configured to: calculate a set of average representations, each average representation being formed by aligning and adding signal segments of the monitoring signal that correspond to a unique combination of validated candidate second pulses; and calculate the parameter value for each of said average representations; and wherein the means (29) for determining the integrity is configured to compare a maximum parameter value to a threshold value. Item 378: The device of any one of items 362-365, wherein the parameter value represents a distribution of signal values. Item 379: The device of any one of items 338-378, further comprising means (29) for processing the measurement signal for identification of heart data originating from heart beats of said subject, and wherein the means (29) for determining the integrity of the fluid connection is configured to determine the integrity based on said pressure data and said heart data. 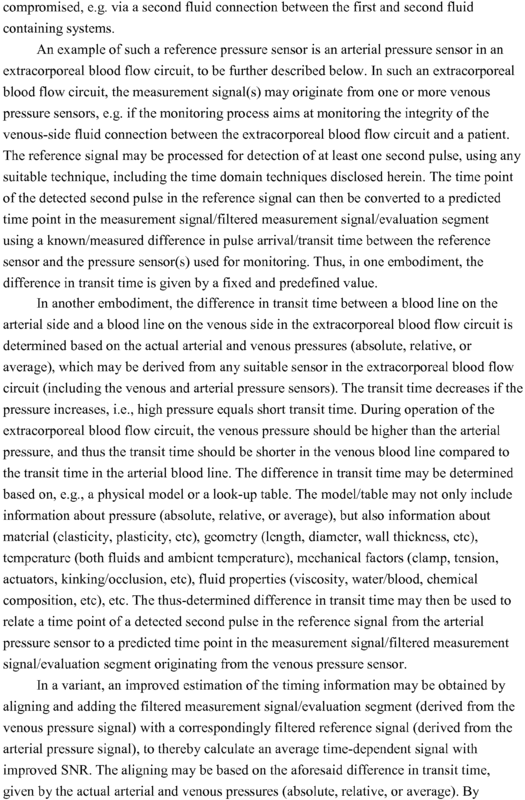 means (29) for processing the measurement signal for identification of pressure data comprising one or more pulses originating from a physiological phenomenon in said subject, said physiological phenomenon excluding the heart of said subject. The device of claim 1, wherein said means (29) for processing is configured to process the measurement signal for suppressing pulses originating from the heart of said subject. The device of claim 1 or 2, wherein said physiological phenomenon is included in the group consisting of reflexes, voluntary muscle contractions, non-voluntary muscle contractions, a breathing system of said subject, an autonomous system of said subject for blood pressure regulation and an autonomous system of said subject for body temperature regulation. The device of claim 1 or 2, wherein said physiological phenomenon is a repetitive physiological pulse generator. 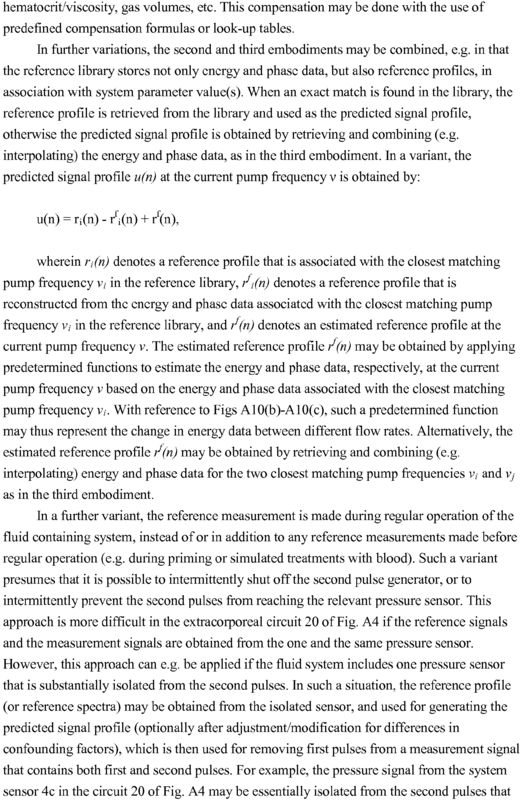 The device of any preceding claim, wherein the means (29) for processing is configured to filter the measurement signal in the frequency domain. The device of any preceding claim, wherein the means (29) for processing is configured to filter the measurement signal to remove frequencies above about 0.5 Hz. 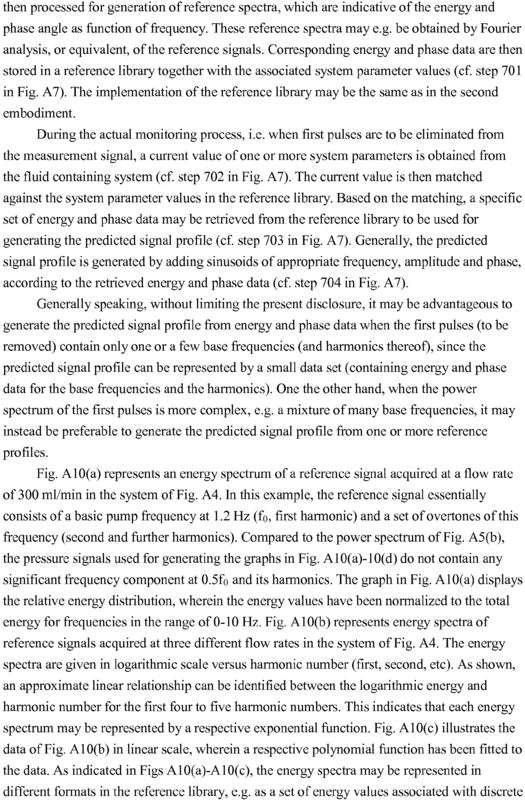 The device of claim 6, wherein the means (29) for processing is configured to filter the measurement signal with respect to at least one frequency range included in the group consisting of about 0.15 Hz to about 0.4 Hz, about 0.04 Hz to about 0.15Hz, and about 0.001Hz to about 0.1 Hz. means (29) for obtaining a first pulse profile (u(n)) which is a predicted temporal signal profile of the first pulse, and means (29) for filtering the measurement signal in the time-domain, using the first pulse profile (u(n)), to essentially eliminate the first pulse while retaining the second pulse. 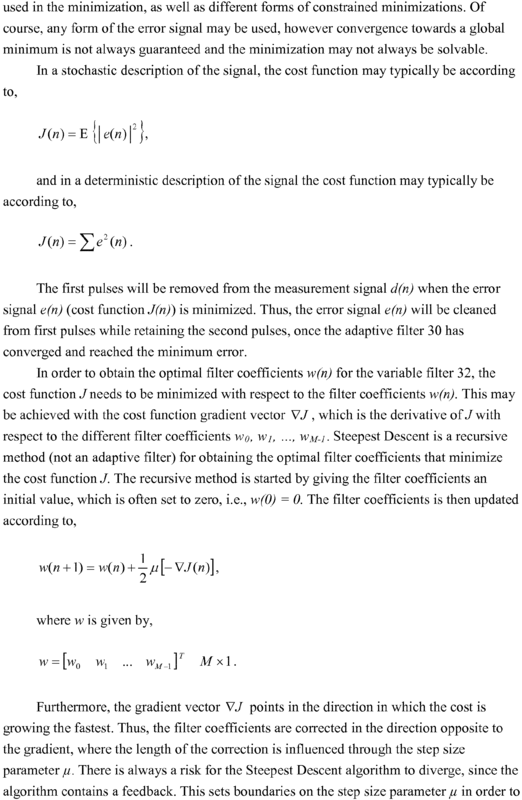 supply the first pulse profile (u(n)) as input to an adaptive filter (30); calculate an error signal (e(n)) between the measurement signal and an output signal (d̂(n)) of the adaptive filter (30); and provide the error signal (e(n)) as input to the adaptive filter (30), whereby the adaptive filter (30) is arranged to essentially eliminate the first pulse in the error signal (e(n)). The device of any preceding claim, wherein said means (29) for processing is configured to perform one or more of detecting, presenting, tracking and predicting a disordered condition of the subject using said pressure data. The device of claim 10, wherein the disordered condition comprises one or more of sneezing, hiccups, vomiting, coughing, blood pressure turbulence, ectopic beats, lack of autonomous regulation, hypotension, disordered breathing, sleep apnea, periodic breathing, hyperventilation, asthmatic attacks, dyspnea, and Cheyne-Stokes respiration. 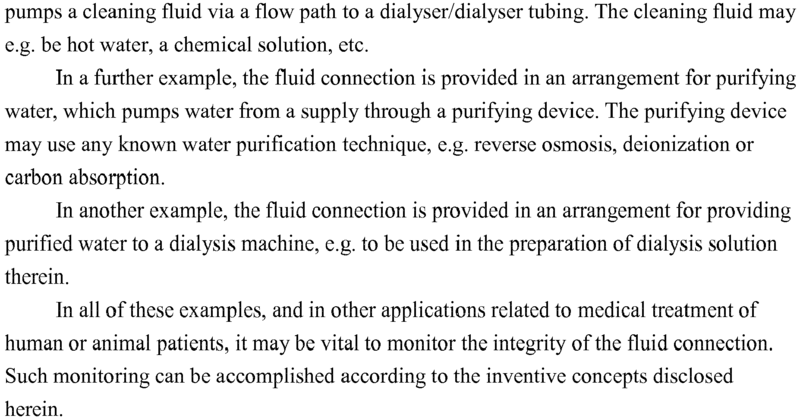 The device of any one of claims 1-9, comprising means (29) for monitoring the integrity of a fluid connection (C) between said extracorporeal fluid system (S1) and said vascular system (S2) based on said pressure data. The device of claim 12, wherein the extracorporeal fluid system (S1) is associated with a mechanical pulse generator (3), wherein the pressure sensor (4a-4c) is arranged in the extracorporeal fluid system (S1) to detect a first pulse originating from the mechanical pulse generator (3) and a second pulse originating from said physiological phenomenon, and wherein said pressure data is a time-dependent monitoring signal including second pulses originating from said physiological phenomenon, said device further comprising means (29) for calculating a parameter value based on signal values within a time window in the monitoring signal, the parameter value representing a distribution of the signal values; wherein said means (29) for monitoring is configured to determine the integrity of the fluid connection based at least partly on the parameter value. identify a candidate second pulse in the monitoring signal and a corresponding candidate time point; and validate the candidate second pulse based on the candidate time point in relation to timing information indicative of the timing of the second pulses in the monitoring signal. 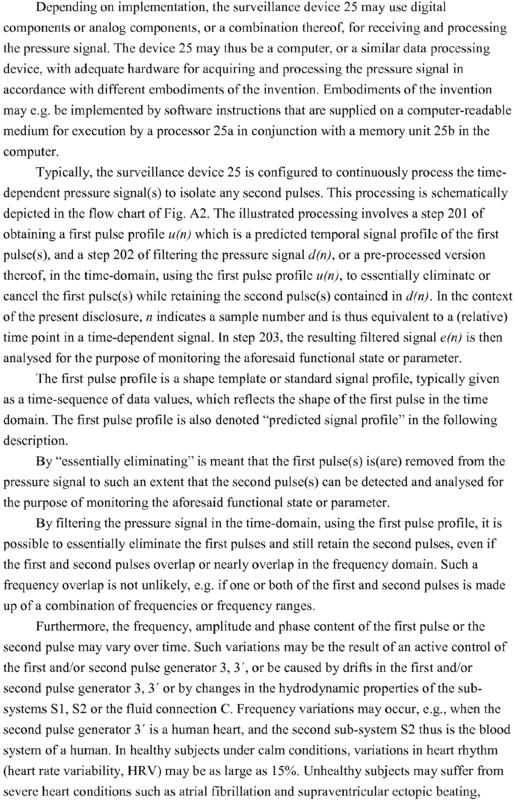 The device of claim 12, wherein said pressure data is a time-dependent monitoring signal including second pulses originating from said physiological phenomenon, said device further comprising: means (29) for obtaining timing information indicative of the timing of the second pulses in the monitoring signal; means (29) for processing the monitoring signal based on the timing information, to calculate a parameter value indicative of presence or absence of the second pulses; and means (29) for determining the integrity of the fluid connection (C) based at least partly on the parameter value. 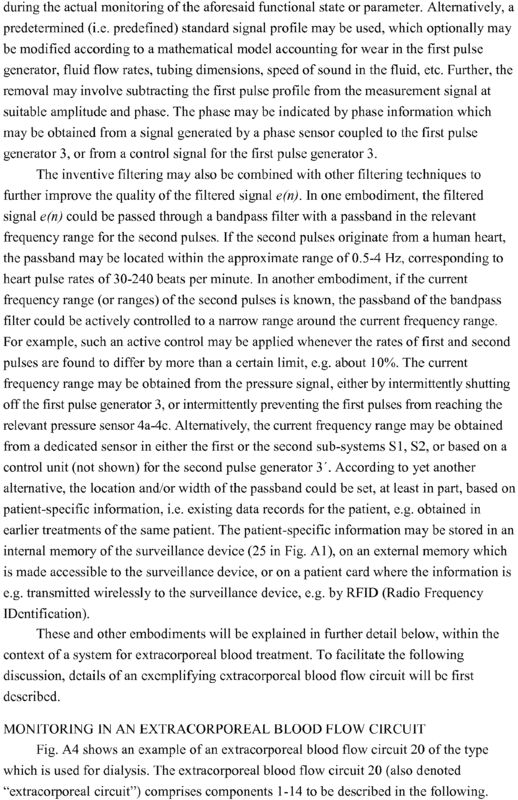 The device of any one of claims 12-15, further comprising means (29) for processing the measurement signal for identification of heart data originating from heart beats of said subject, and wherein the means (29) for determining the integrity of the fluid connection is configured to determine the integrity based on said pressure data and said heart data. processing the measurement signal for identification of pressure data comprising one or more pulses originating from a physiological phenomenon in said subject, said physiological phenomenon excluding the heart of said subject. A computer program product comprising instructions for causing a computer to perform the method of claim 17.